Well, lately its been raining here in Puebla. Which is really unusual. 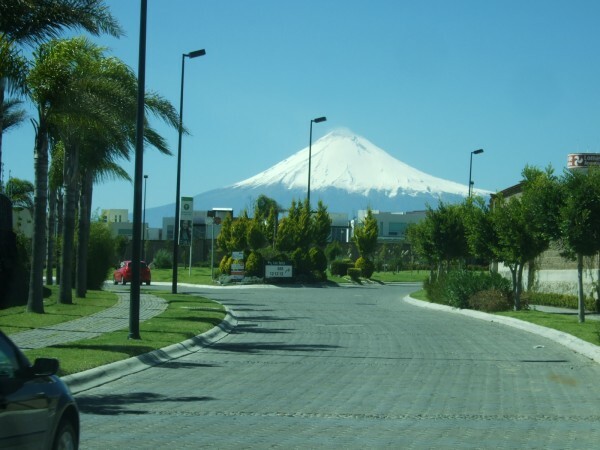 Normally it rains during the summer time, and we are able to see the volcanoes full of snow all during this time. 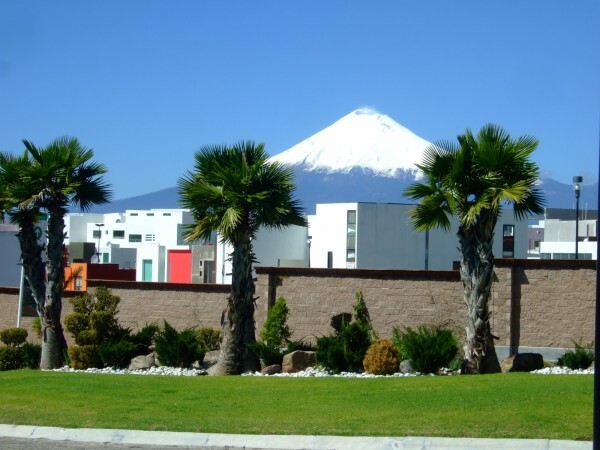 Puebla is surrounded with 4 volcanoes. 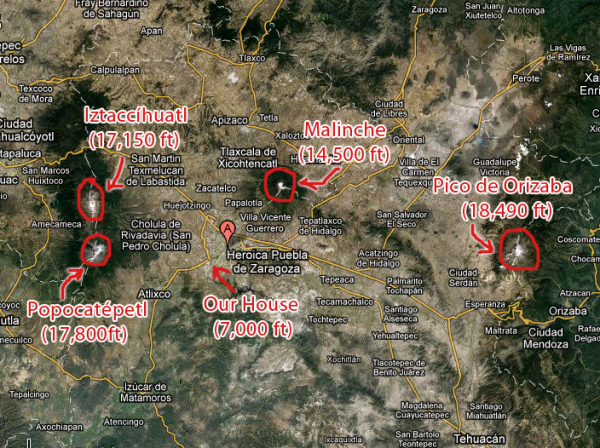 3 of them are very close, and 3 of them are the highest mountains in Mexico! 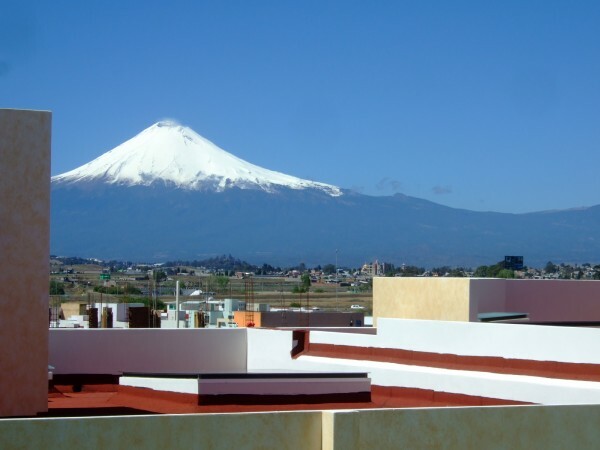 To the west, we have two very beautiful volcanoes, which are the Popocatépetl, an active volcano of 5,426 mts (17,800 ft), and Iztaccíhuatl which is 5,230 mts (17,159 ft). Don’t forget that Puebla is very high up too! We are at 7,000 ft over the sea level. We are able to see this two volcanoes from our house every day. They are behind our house and I really look forward for nice and clear days and see what God has created. It is really breath taking when you see them on very clear days. I remember one day driving to the church and stopping to take some pictures of the volcanoes. Right after I took the pictures I listened on the news on the radio someone calling and saying that he had been living in Puebla for at least 50 years! and has never seen the volcanoes so beautiful. I am glad I took the pictures! Anyway. I like taking pictures of the volcanoes. Here is a view of the city of Puebla with its 4 volcanoes. Let me know if there is any volcanoes where you live. Do you live near a volcano? Wow! 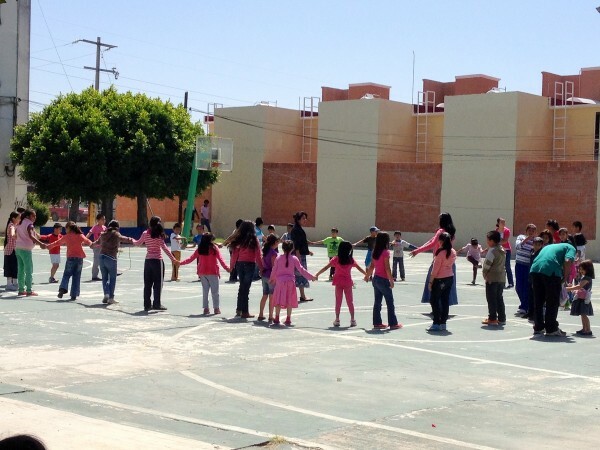 I cannot believe we have been here in Mexico over 15 years! When we first arrived, it was only my wife, and our three-month old baby, Japheth. Now, we are nine in our family (including my wife and I), and our church in doing amazing! 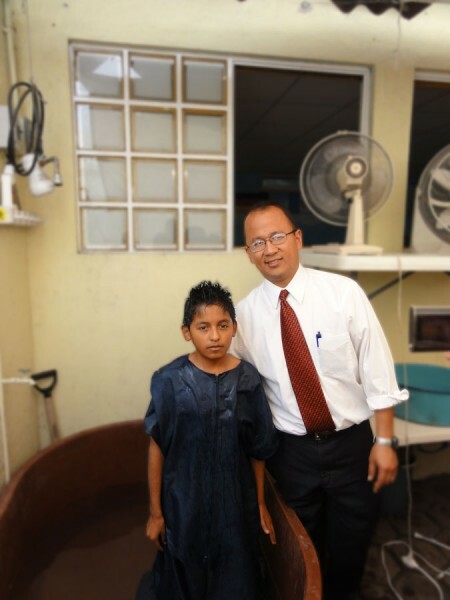 Ministries are growing, souls are being saved, and families are being restored and — even formed. By that, I mean, that I am having part in marrying five different couples in 5 consecutive months! — what a privilege! God is sooo good! I would like to start saying thank you to all of you that have supported our ministry since the beginning. 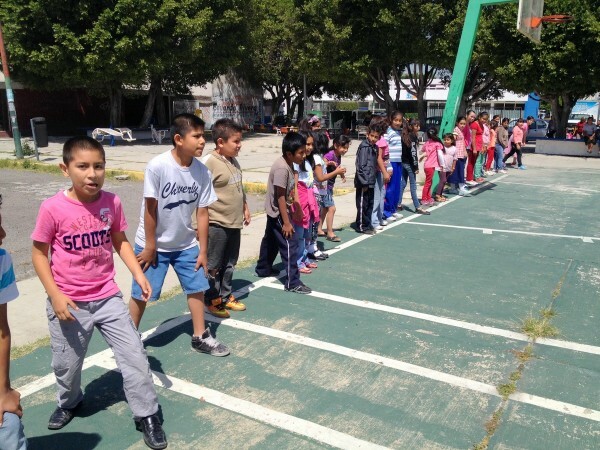 Many churches have kept holding the ropes while we reach Mexico for Christ — and for that we are very thankful! Thank you for your prayers and continual financial support. 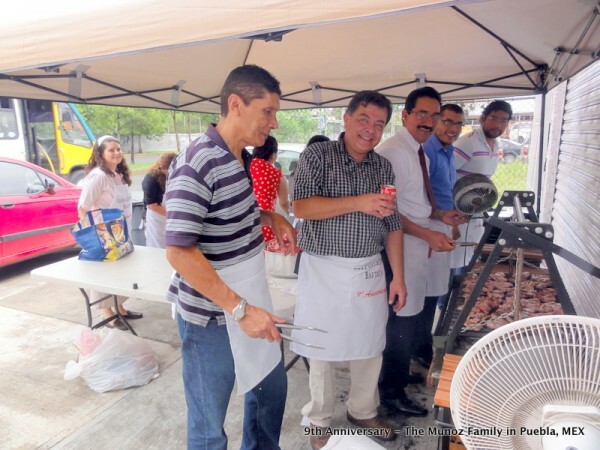 On July 7th, 8th and 9th, we celebrated our Family Conference. 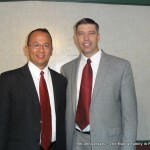 We invited Pastor Stew Schepers, from the Dominican Republic, to come and preach in our church. God used him in a very special way, and he and his wife Donna, were a big blessing to our church. Our theme was “A house worthy for the Lord” from Mathew 10:13. 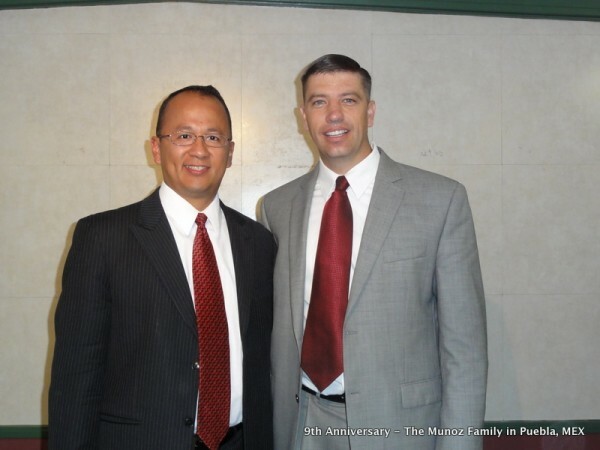 On Sunday, we celebrated our churches’ fifteenth anniversary. 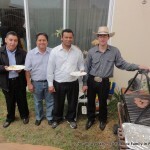 We had an amazing day, with visitors, baptisms, decisions, and of course ‘carne asada’ for a special meal! 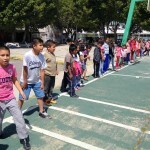 Normally, we organize our youth camp here in Puebla. 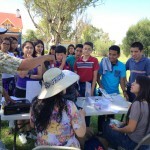 Many churches from around the area come and are part of our camp. 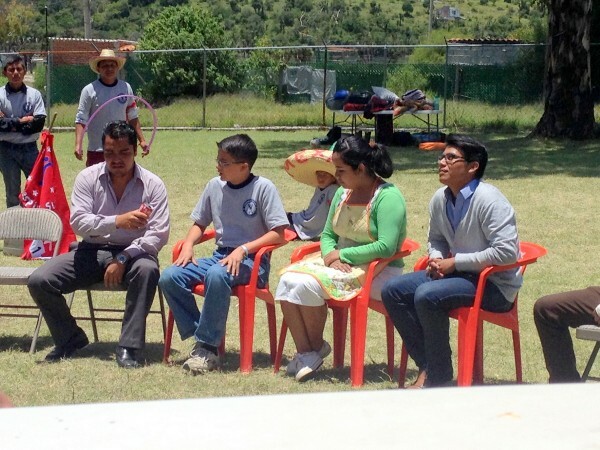 But this year, I was invited to preach at the META camp in Morelia, Michoacan, where Bro. Jim Gardner is the camp director. It is my personal opinion that there is no better organizer for a youth camp than Bro. Gardner. We took thirteen young people from our church and we had a blast! 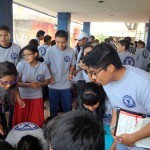 From the preachings and teachings, to the games and meals, and the ‘fogata’ time on the last night, God really blessed, and many of our young people made decisions. 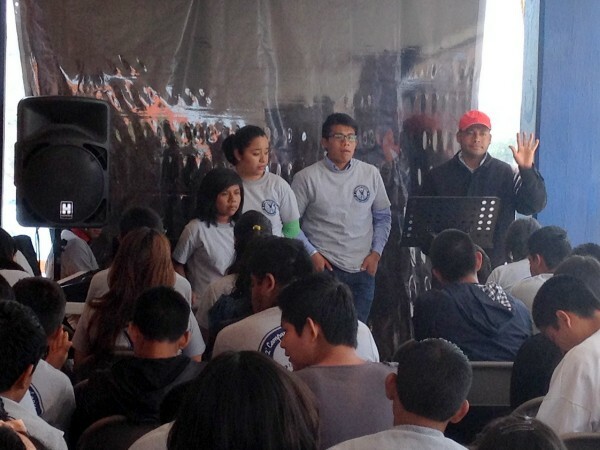 There were a total of 200 young people at camp, and I was honored to be a small part in their spiritual lives. I praise the Lord for that opportunity. 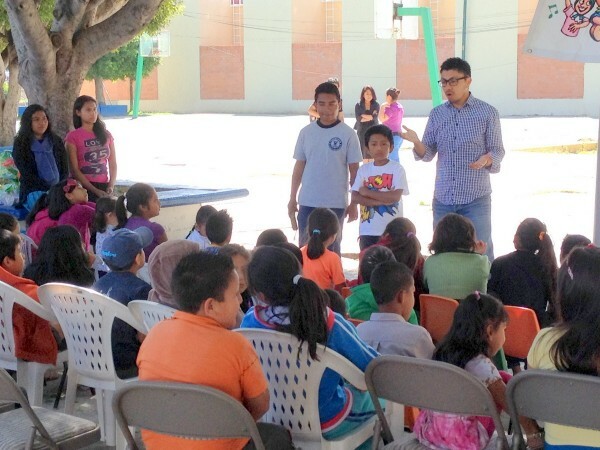 This year, we invited evangelist David Cruz to help organize and preach during our vacation Bible schools. 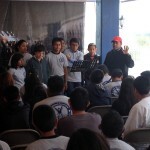 He brought a team of young people with him, and did an amazing job! 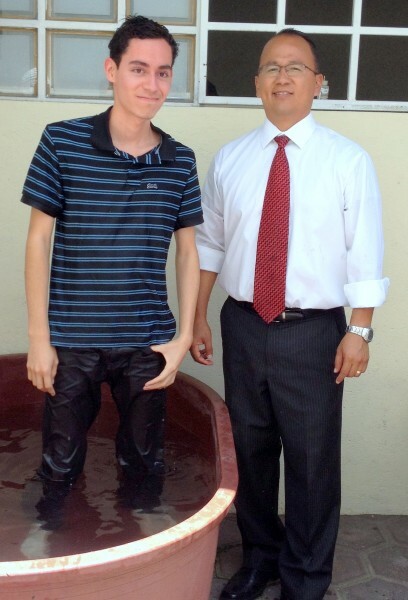 I recommend this young man if any church would like to have an evangelist preaching or to hold revival meetings. 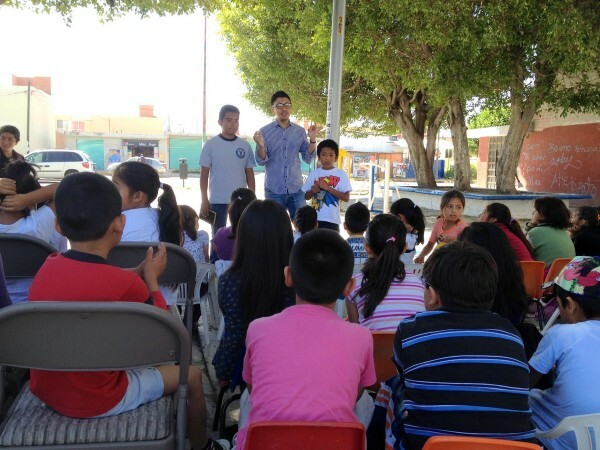 We held meetings at seven different locations with a total of over 1,000 people from all ages, and they all heard the Gospel and many, many got saved! 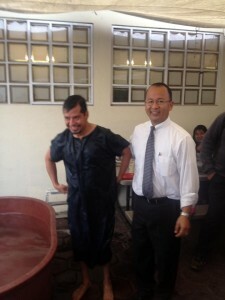 At the end we had 56 people getting baptized. 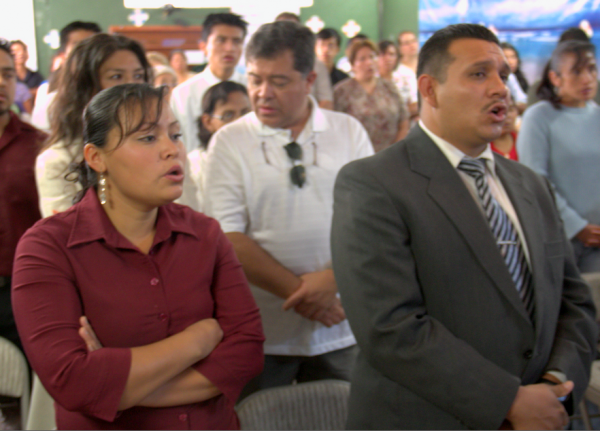 On Sunday, we brought close to 50 of them to church. Our people did and incredible job organizing the VBSs and volunteering for teaching and helping in their respective areas. 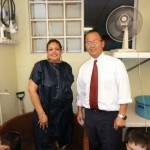 One lady in our church works as a teacher not far from our church. Few weeks ago she asked me if I could help counsel the dad of one of her high school students. His name is Ivan. He met me at the church, and with a broken heart told me that his wife was leaving him. Apparently, she found someone in social media and now his home was being destroyed by all of this. 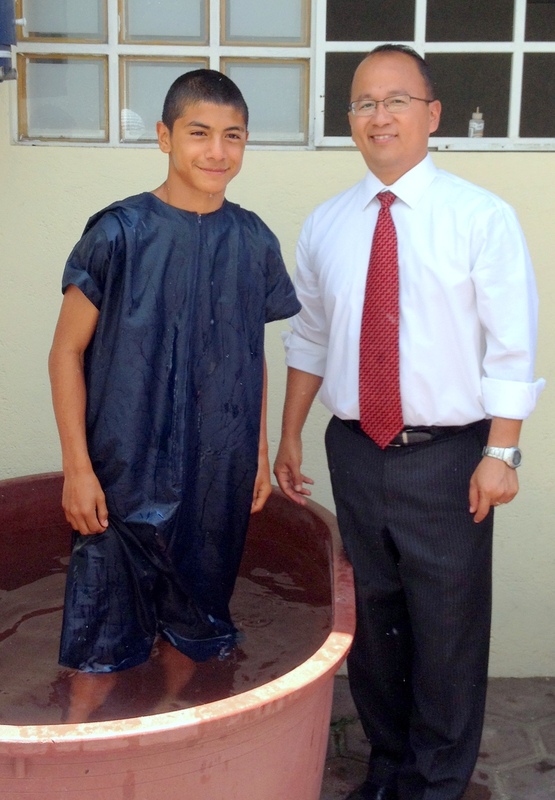 I was able to lead him to the cross, and Ivan graciously asked Jesus to save him. 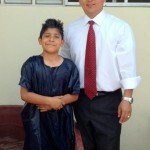 Please pray for Ivan Sandoval and his marriage. He wants to do right. They have two young boys. Many homes here in Mexico are struggling with not only the husbands leaving theirs wives, but now, the wives leaving their husbands. Right now I am writing this lines from McAllen, TX. One of the reasons for the trip is so that we can nationalize our fifteen passenger van. 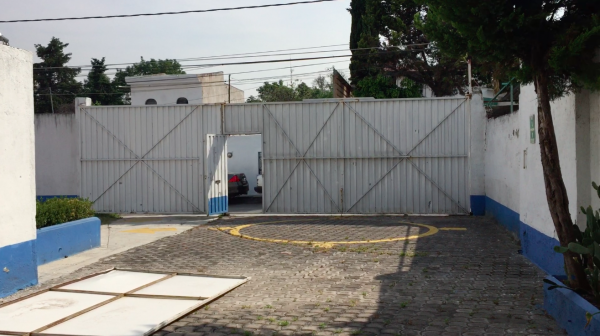 This last Monday I took our van to the offices where they do all of the paper work on the American side, and I am supposed to pick it up on Thursday on the other side, in Mexico — with all of the paper work done. 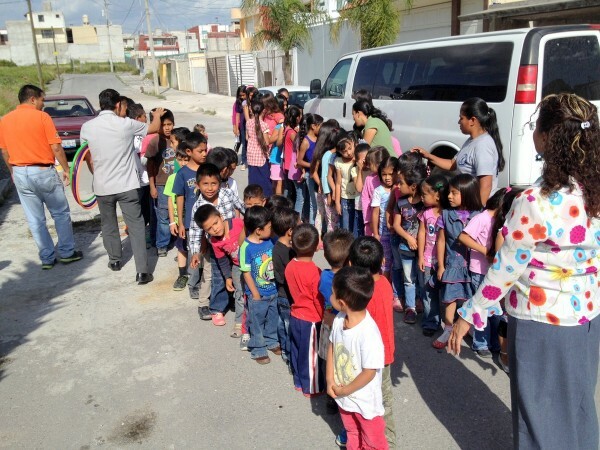 Pray so that we don’t have any problems legalizing the van and taking it to Puebla. 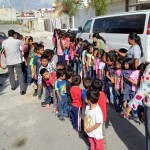 Buying a van in Mexico is very expensive, and what we have done in the past with this van is driving to the border every six months and getting a permit so that we can have the van ‘legally’ in Mexico for exactly six months. 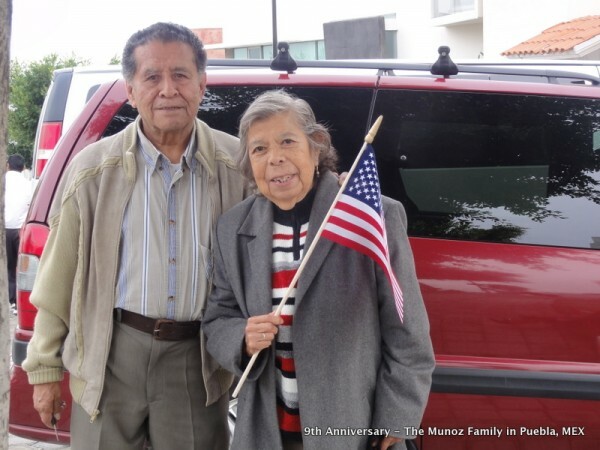 When the vehicle is ten years old, the Mexican government allows for those cars to be imported legally into Mexico at a high price — we had to pay $2,000 dollars for the importation of the van! Thank you again for all of your prayers and support! 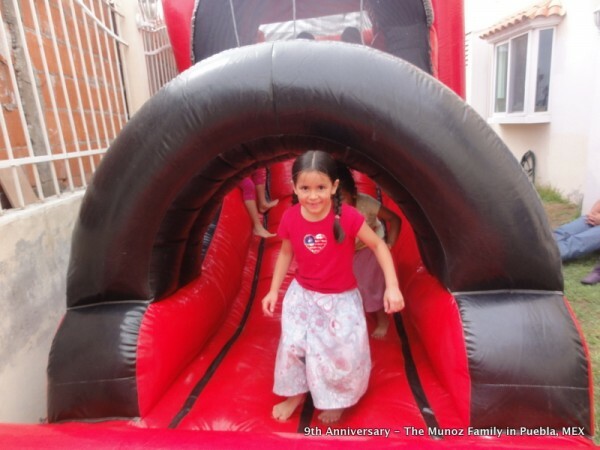 Aug 2017 Munoz Family — PDF format. Our National Leadership Conference was a Success! Thank you for your prayers for our Leadership Conference. Praise the Lord, we had 16 people that surrendered their lives to serve our Lord and Savior full time! We also had an attendance of 550 people and among them, we had 44 Pastors, assistant Pastors and Missionaries attending our Conference. 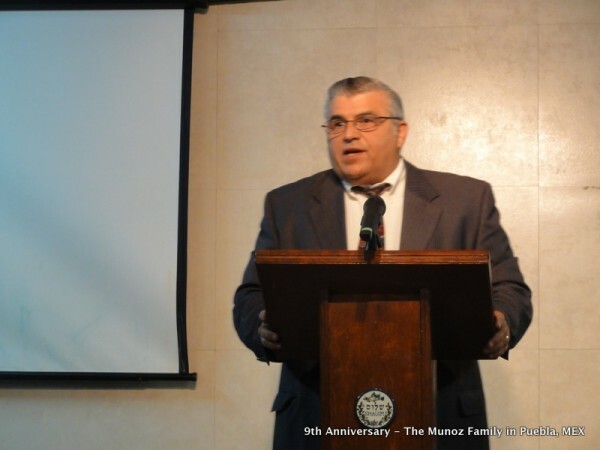 We had the privilege to have the following guest speakers during our conference: Pastor Kevin Wynne, from Mexico City; Pastor Luis Ramos, from San Luis Potosí; Pastor Luis Parada, from Long Beach, CA; Pastor Oscar Galvan, from Sahuarita, AZ; Pastor Gil Torres, from San Diego, CA; and Pastor Alejandro Cordova, from Celaya, GTO. All of them were used by God greatly to bring exactly what we needed! 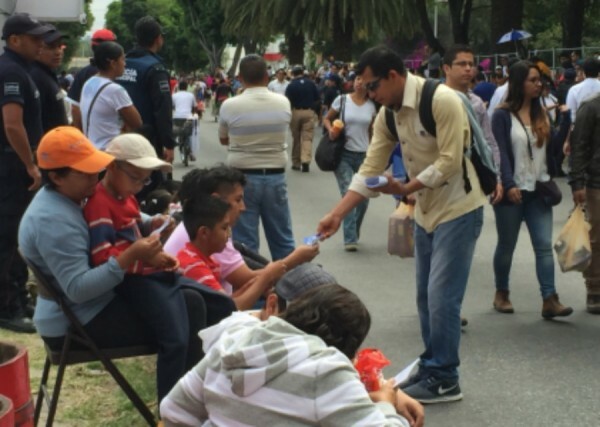 As we do every year, we were able to go early on the morning of “Cinco de Mayo” and give 20,000 tracts just before the Battle-of-Puebla-Parade started. 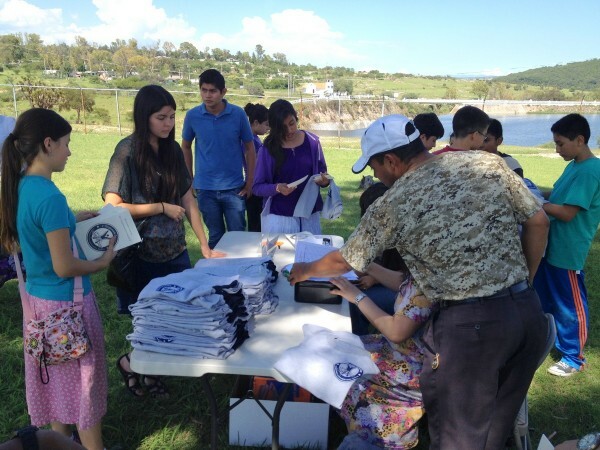 Our family had 1,000 tracts, and we gave them out in less than 30 minutes. One young men that we sitting waiting for the parade to start, helped my oldest son Japheth, to give out some tracts to the group of people around him. 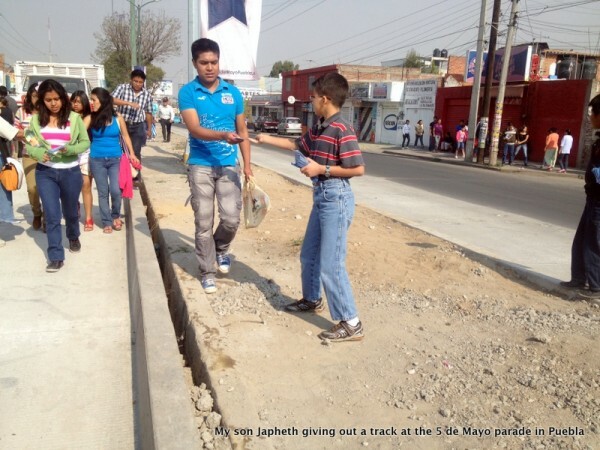 I even took some pictures of this “unbeliever” helping us give away these Gospel tracts! Praise the Lord many, many people were reading these tracts, and I am sure, many got saved! I would like to thank all those who had been praying for the purchase of our new church property. 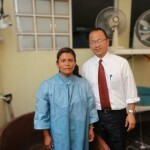 The owner accepted our proposal and within 30 days we were able to come up with the first 1 million pesos! We only had 300k and God provided the rest through a series of miracles. 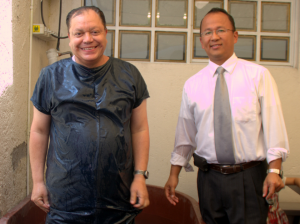 The first one is that our church gave an extra 300k pesos within 20 days! The last miracle is that we were still short 120k pesos and a brother from another church new about our need and gave the rest of the money! We are so excited about this answer to prayer. We have been looking for a new place for our church for quite-a-while. This new place has 800 square meters of land and is a little over three times the size of our current place. Our 14th anniversary is the first week of July and we would like to have our first service in the new place by then. Pray that this will happen! Few days ago, my wife and I were witnessing to a man named Raul Jimenez. 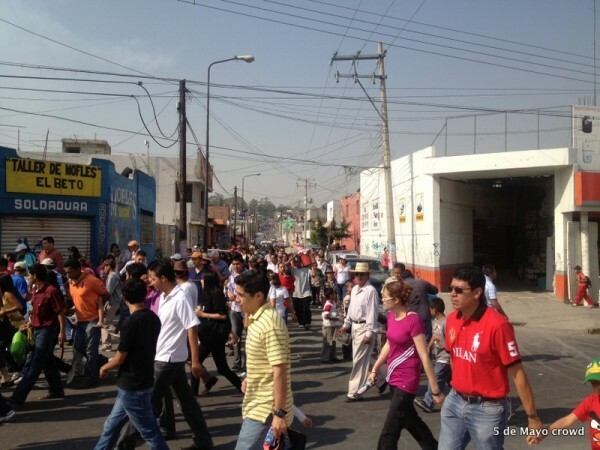 We were in an area that is inundated with people from a sect named “Luz del Mundo” (Light of the World). This sect buys and rents houses all around their main church, and is very difficult to find people that does not attend this church. 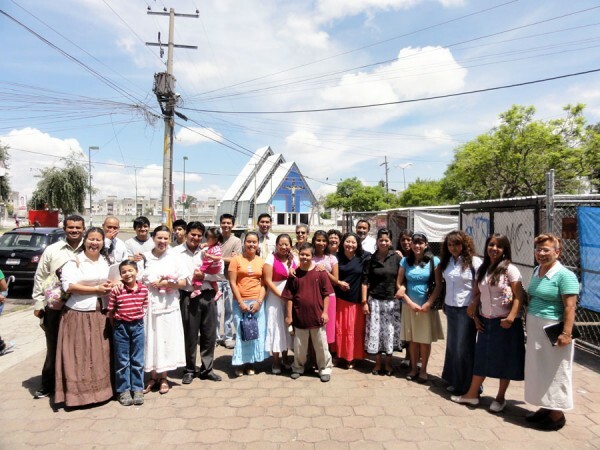 This sect is very similar to the Mormon church; it is like the Mexican version of it. 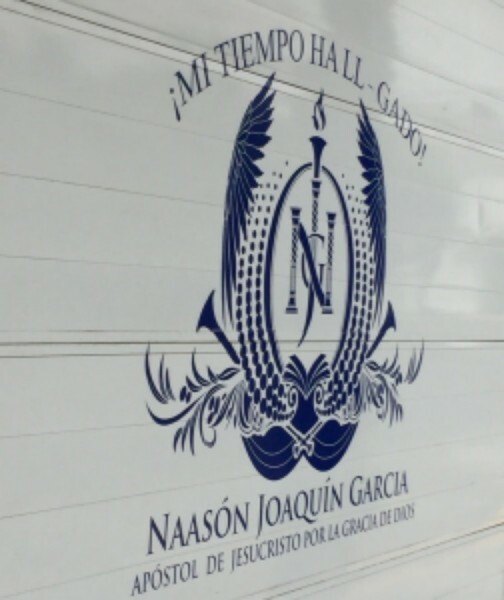 They worship an “Apostle” named Naasón Joaquín García. Anyway, after I was done talking to Raul, I asked him if he wanted to pray and ask God to save him; he, without hesitation, bowed his head and started to pray by himself, a very honest prayer for God to save him. Praise the Lord for God’s grace, and for one more person going to Heaven! Please pray that we can sell our current church building at a good price and fast! so we can finish paying the new church property. The owner is giving us three months after the first down payment to pay the rest of the money for the new property. Thank you! 200 in attendance, 10 saved!!! 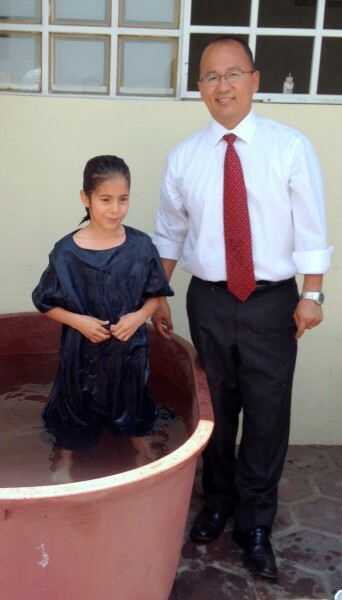 and 7 baptisms!!! We had a great week holding 3 Vacation Bible Schools at the same time. Our highest day was on Friday with 95, 70 and 60 on each of of them, making a total of 225 kids and adults attending. Our goal for the following year is to have 5 different Bible Schools in 5 different locations of our city. 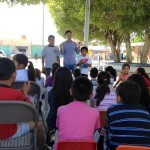 We praise the Lord for the many, many kids that heard the Gospel over and over throughout the week and that God saved!! Two days before Sunday, I asked our neighbor if we could use the empty lot that is next to our church, so that we could accommodate the 80-100 kids that we were going to have for Sunday, and he, not only sad YES, but he said that if we wanted to use the lot to park the cars on Sunday, we could DO so!! Praise the Lord for this. 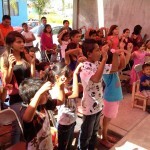 We do not have enough room for 100 kids in our church and God surely answered our prayer! 225 attended our 3 different Vacation Bible Schools! On Sunday we broke our previous record for attendance! 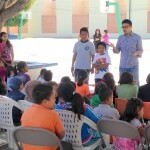 We had 200 people in church; 100 kids and 100 adults. The most exciting thing about this is that we not only had the kids that attended the VBSs, but we also had their parents attending. They came to see their kids receive their diplomas for completing the VBS. We had 32 Adult VISITORS!! and 12 of them received Christ as their personal Savior!! This is so exciting as well. You could see the whole church so happy, and helping and motivated to see what God is doing in our midst! We also had 11 BAPTISMS. 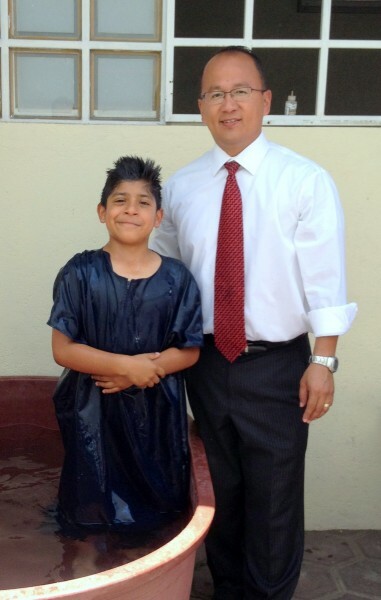 7 of them got baptized in our church and 4 got baptized in our mission church. 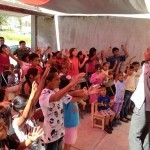 Our mission church is also doing very well. 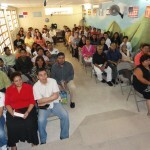 Last Sunday we had close to 100 in our mission church. That means that we actually had close to 300 last Sunday! 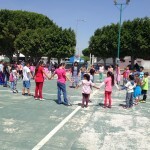 Please pray that we can start a second mission church here in Puebla ans see more people saved. 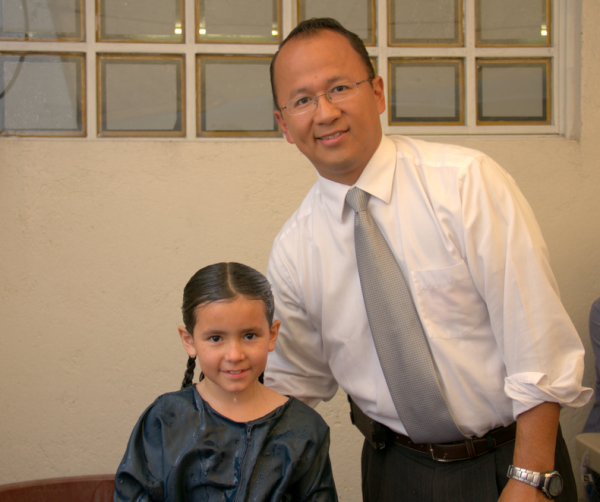 7 got baptized last Sunday! For our safety this Friday and Saturday. We are traveling to Texas to renew our van’s permit. We will be visiting some churches while we are there. (August 10th to August 30th) Pray that more churches will take us on. For a bigger place for our church. 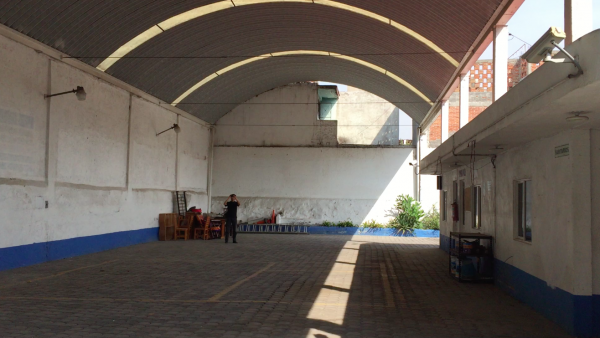 We would like to sell the building that we have and find a property that is at least twice as big. For our Bible Institute. We start the second week of September and we are praying for 10 students or more. For our young people that are going away to a Bible Institute. 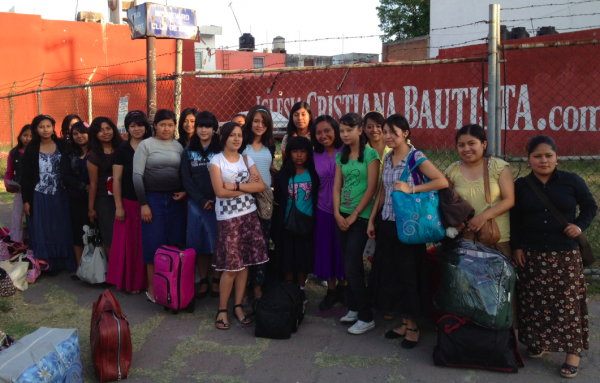 We have 5 young people and 1 matrimony going to San Luis Potosi to study there in the Bible Institute. 4 of them are from our church and 2 are from our mission church. Our mission church is in a very poor area, and subsequently, one man, who is very poor, is leaving this Friday to go to the Bible institute. He is taking his wive and three children by faith to the Institute that is about 5 hours away. If you would like to make a one time offering for this precious family, we will be very thankful. Or if you would like to support them with $50 or $100 dollars a month while he is in the Institute, that, I am sure, will be a big investment in the work of the Lord. His name is Abel. I will try to post a picture of their family so you get to know them. Thank you! Thank you and may God continue bless you! Last Monday we had a special dinner for our visitors that we usually have every three months. 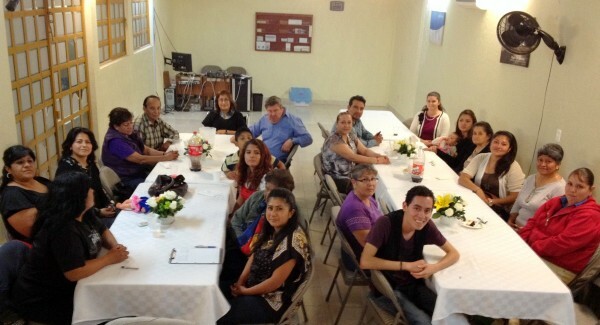 This time we had 25 people that in the past had visited our church, that showed up for this special dinner. 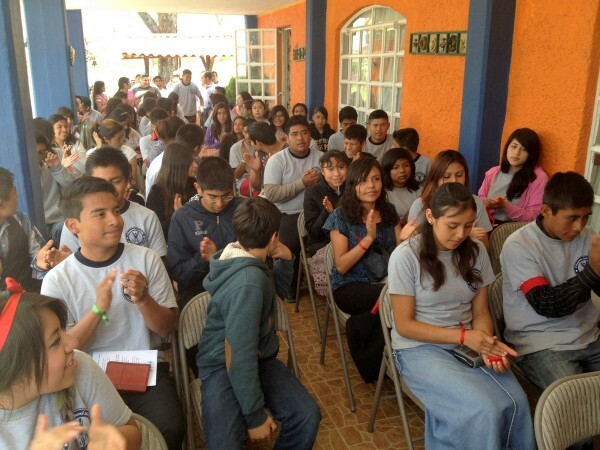 At the end we encourage them to take a discipleship class on Wednesdays and 10 subscribed for the discipleship class! Today was an uncommon Sunday. Normally, we have people visiting our church every Sunday. But today was incredible! We had 23 people visiting our church! Besides this, we had 7 people that visited our church last Sunday and returned this Sunday for the second time! 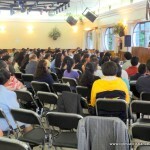 The church auditorium was packed! We need to expand as soon as possible. Thank you for your prayers and financial support. For our vacation Bible school that we are having next week. 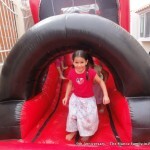 This time we are planning to have 4 VBS at the same time in different areas of the city. Time of activities here in the camp. 3 Surrendered For Full Time Service! Seven Baptisms and a Wedding! 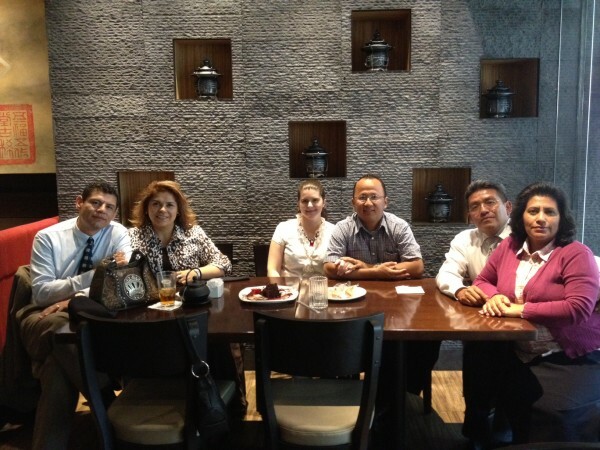 In the month of February my wife and I had the opportunity to visit our church in Puebla for few days. 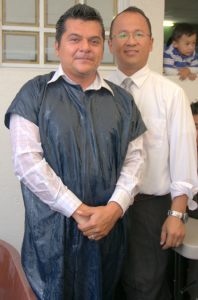 The main reason was that my assistant Pastor, Cristian, got married. 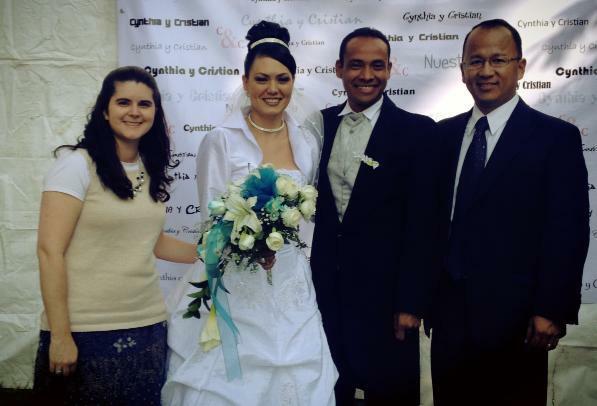 The wedding was in Mexico City, and Pastor Arandai married Cristian and Cynthia. 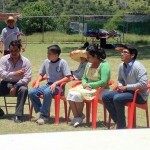 They are now happily married back in our church in Puebla, serving the Lord! 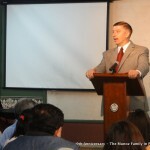 On Sunday the 17th, I preached all three services in our church. What a blessing it was to see the Christians we love the most — our own church. We miss them very much and can’t wait to be back in June or July. During our time there we had five visitors in the morning and three more Sunday night. 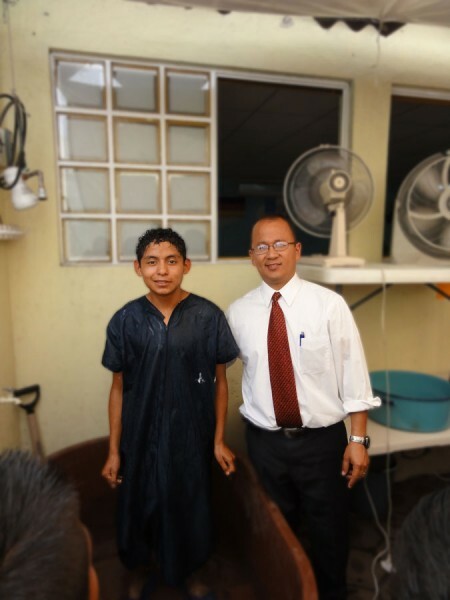 I also had the privilege to baptist seven believers. One of them, Leonardo, was studying to be a Catholic priest. About eight months ago, while soulwinning with Brother Manuel Garcia, we gave Leonardo’s mom a track and invited her to church. 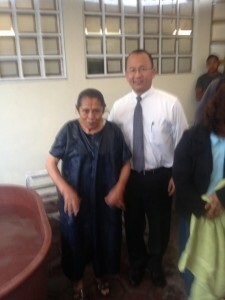 She got saved and came with her thirty year old son. Leonardo got saved in our church, tuned from Catholicism to God and from wanting to be a Catholic priest to serve the Lord faithfully winning souls for Him. What a blessing it was to baptize him, his mom, his sister and his nephew! 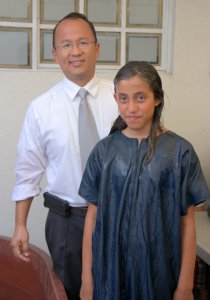 That same Sunday we sent my brother-in-law Alejandro, my sister and their three kids to start a church in Cuajinicuilapa – try to say that 5 times! Cuaji, for short, is on the south part of the country, on the coast, near Acapulco. As you might know, Acapulco was just considered the second most dangerous city in the country of Mexico. 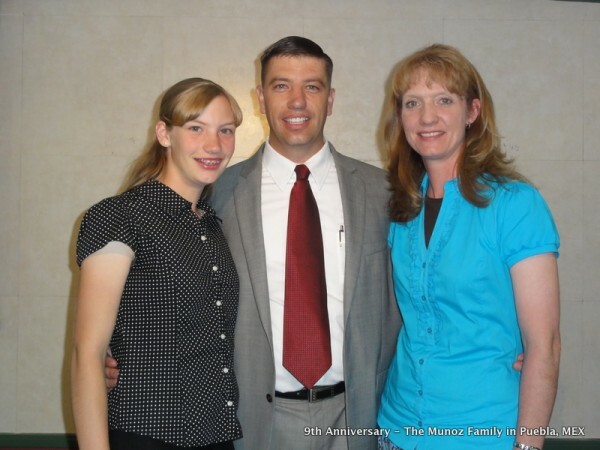 Please remember them in your prayers and if you are looking for more missionaries to take, they are worth taking. They went under-supported, and any additional giving will be big blessing to them. They have about 7 churches supporting them right now. My sister, Aglaee Munoz, graduated from Oklahoma Baptist College and my brother-in-law graduated from our Bible Institute of Puebla last year. 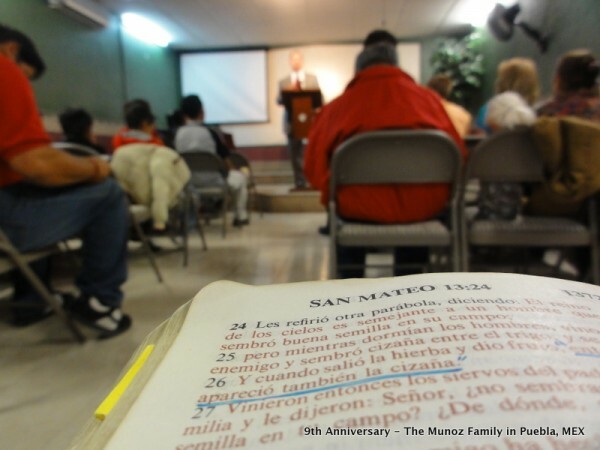 The following Sunday we were in a Missions Conference in Santa Ana, CA at Bethel Baptist Church. This church has been a tremendous blessing to our ministry. Their support and prayers through the years has always been there. 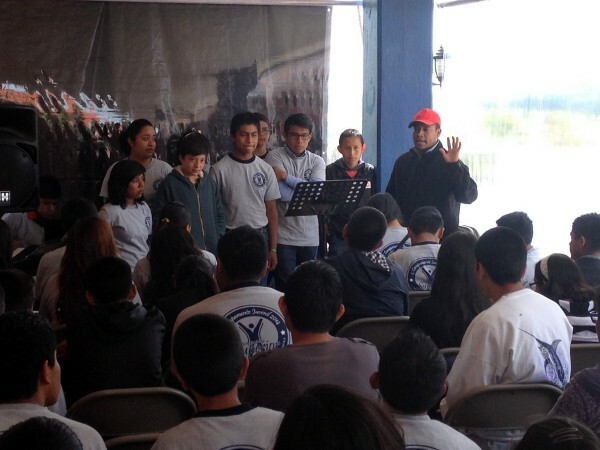 I had the opportunity to present what God is doing with their faith promise in Puebla. We had a good time. Pastor Dan Davidson still the Pastor after all these years, serving the Lord, and always with a smile. 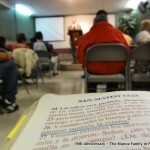 And Sunday night we were at Temple Baptist Church of Perris, CA. The Pastor of the church graduated from Oklahoma Baptist College and is doing an excellent job in this church. I believe he took over the church about three years ago with 100 people, and now they are running over 300 people. 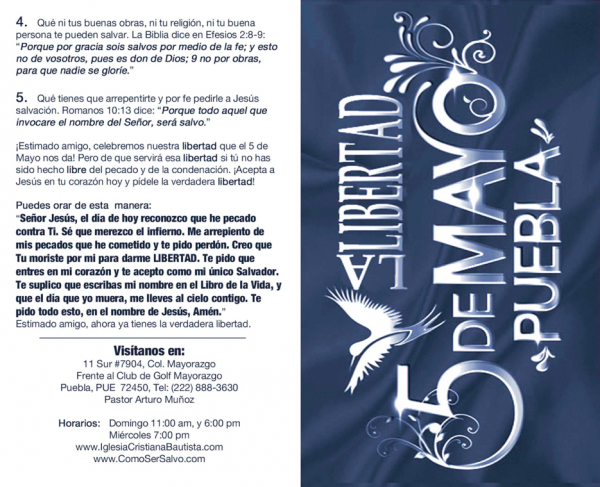 Next Sunday they are having two Sunday Morning Services to accommodate more people. Their welcome video is one of the best church videos I have ever seen. If you are planning to make one for your church, take this one for consideration, as it has an excellent outline and powerful message. 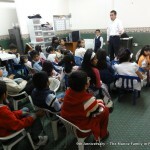 After their evening service, we stayed to present our ministry to the Spanish church. 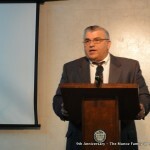 Pastor Emilio Llausás has been the Spanish Pastor of the church in Perris, CA for the last 40 years. I believe God used the message to encourage the people to continue serving the Lord. The Pastor said that they might take us on for support! When we left our church few months ago, we only had 17 churches supporting us. 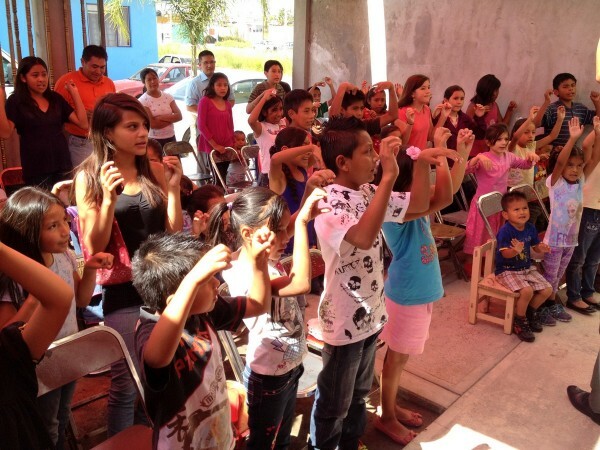 Right now we have 21 and we are praying for 30, so that we can go back to Mexico and continue with the ministry that God has given us. Thank you for your prayers and God bless you. 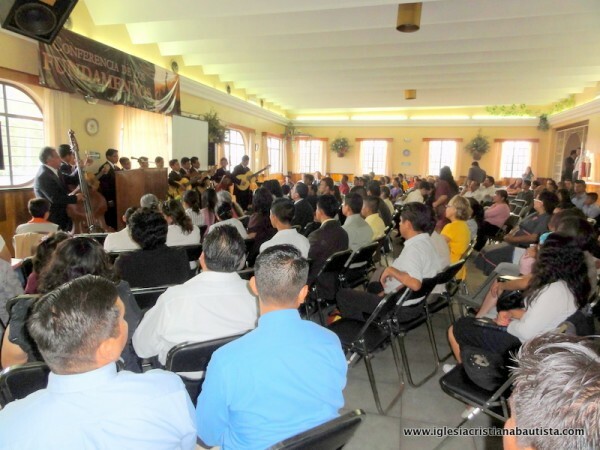 This last week I was invited to preach in a Missions Conference in Tepecuacuilco, near Iguala Guerrero, the town I grew up in Mexico. 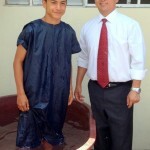 Brother Rene Arteaga is the Pastor there and he is doing a tremendous work. 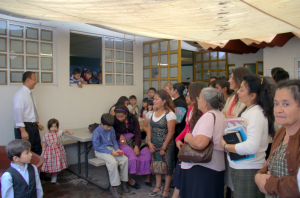 He is pastoring the main church in Tepecuacuilco, and at the same time he is preaching in two other towns during the week. 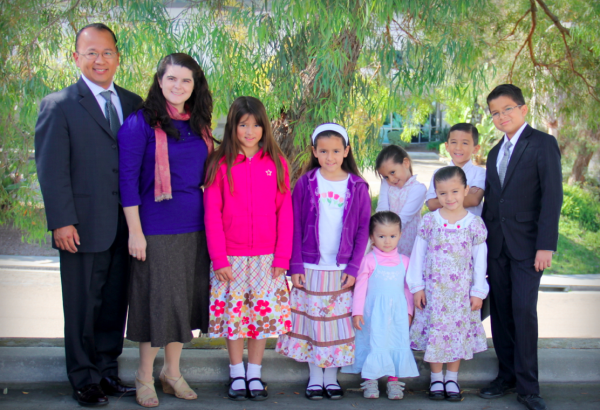 Our church here in Puebla supports this dear family as a missionary. If you know someone from “Tepecua” maybe they can too be a blessing to this family. Our Bible Institute classes are over. This coming Sunday we are graduating three! This is our fourth year and we continue to be excited about it. 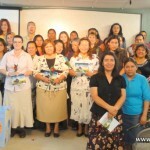 Next year we are switching our Bible Institute here in Puebla to have it in the morning. Our plan is to have the classes from Tuesday to Thursday, from 8:00 am to 12:00 pm. 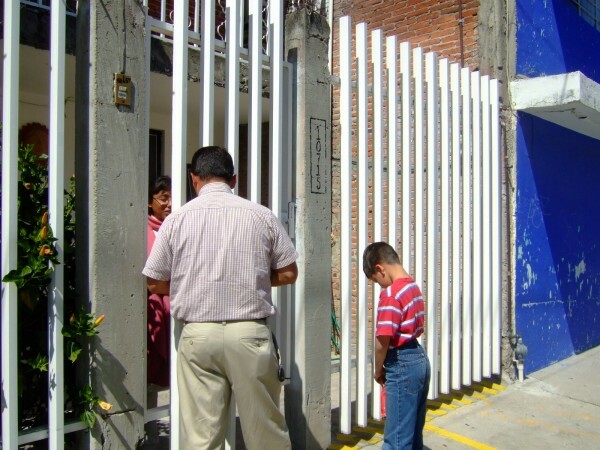 That way, those that come from out of town, can stay in Puebla for three days and then go back during the weekend to help their churches. 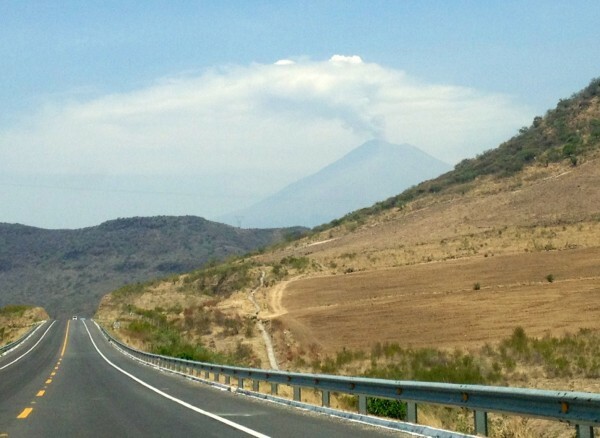 As you know the volcano here in Puebla has been a little active. Here is a picture I took (with my iPhone) on my way to Tepecuacuilco. 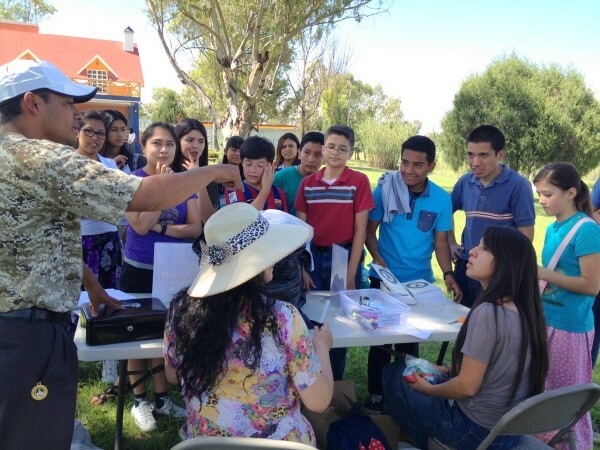 20,000 Tracts given at The Battle of Puebla, 5 de Mayo, parade! 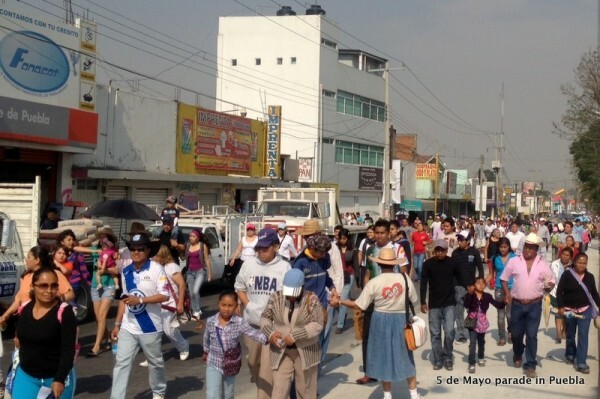 Yesterday Puebla celebrated their 150th anniversary of The Battle of Puebla, which happened on May 5th 1862. Every year we have been present at the parade, but not to watch the parade, but to give out tracts. 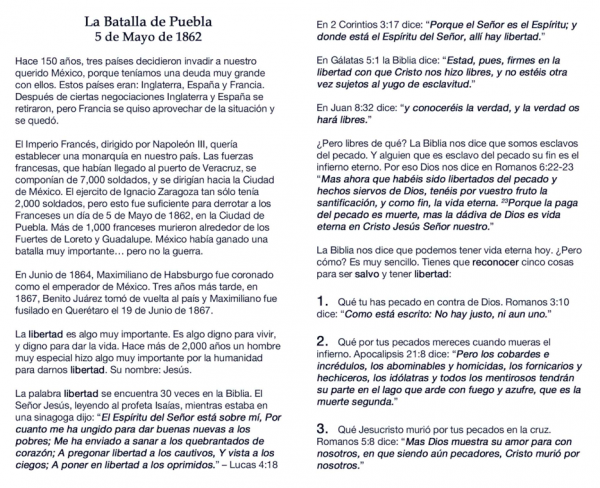 This time we made our own tract, explaining a little bit about the Battle of Puebla, talking about the freedom that we have, and then explaining the real freedom from sin that Jesus can give them. It was a total success! We saw very little tracts in the floor. All of them were taken and many people were reading them right there! Many asked for more. I heard a mom saying to her daughter: This is great for your homework! We printed 20,000 of these tracts. If you want the original files I can send them to you and you can give them out next year in your own town if you happen to have a parade of some kind for the 5 de Mayo. This last Tuesday and Wednesday we had the Knabb’s staying at out house. 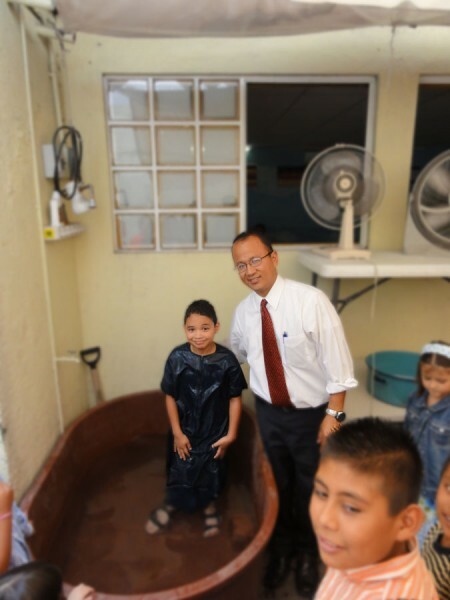 Brother Knabb and his wife are serving the Lord in the south part of the state of Veracruz, in Jaltipan. 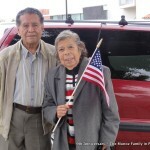 They brought with them Brother Manuel and his wife and three kids. 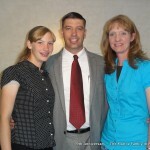 Brother Knabb and his wife Sarah (Sloan) have six kids! 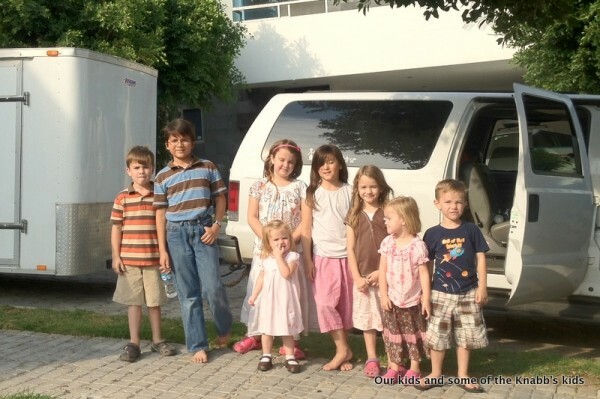 So, we had a total of 18 kids and 6 adults in our house… clearly outnumbered! 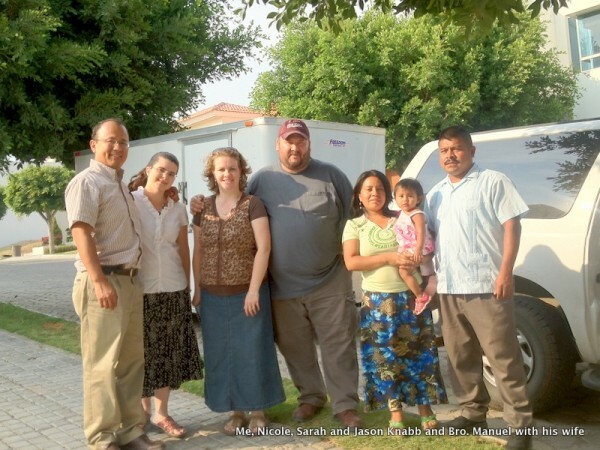 Sarah was in Bible college at the same time I was, and I had not the privilege to know her husband that much, but few hours with them were enough to get to know them better and enjoy their company even more. 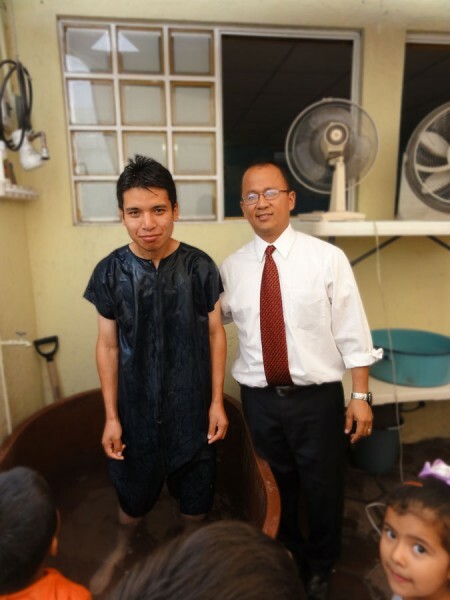 Brother Manuel is a faithful servant that decided to homeschool their three kids — they also attended the Homeschooling Conference that I had a part of last week in Queretaro, where Brother Steve Miller serves. The Munoz / The Knabbs / Bro Manuel, wife and daughter! Today we celebrated Mother’s Day at our church. We had 50 moms and they all got a rose, with a special note and a nice picture with a Bible verse. At the end we had cake and some fellowship. 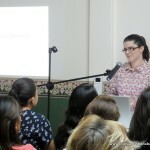 I preached 7 Great Things that we can Lear from 7 Great women in the Bible. They all enjoyed the service and we had a good time in church. We also gave out some certificates. Some baptism certificates, some for those that finished the Basic Discipleship Lessons, and some for those that finished the Advanced Discipleship Lessons. 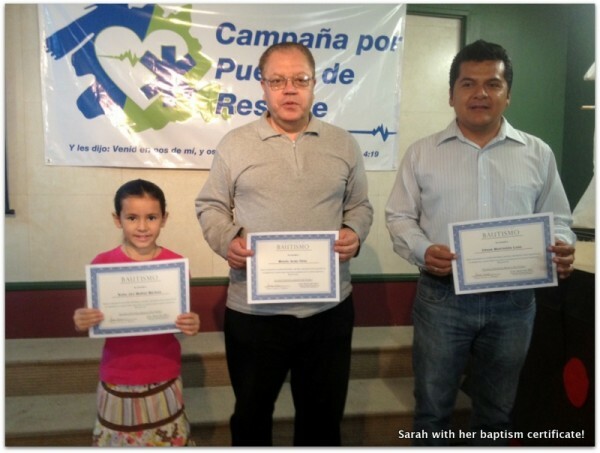 In the picture is Sarah holding hers with Brother Miguel and Brother Cesar. They got baptized about a month ago. Please pray for our Conference. It starts tomorrow and ends on Wednesday. 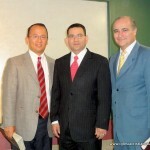 Our guest speakers are Pastor Luis Parada, Pastor Luis Ramos, Pastor Ezequiel Salazar and Pastor Kevin Wynne. 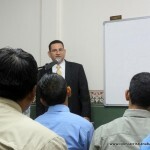 If you are interested in the MP3 audio files of the preachings in Spanish let me know. 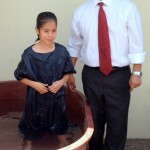 Sarah, Our Daughter Got Baptized! This morning was a special morning. 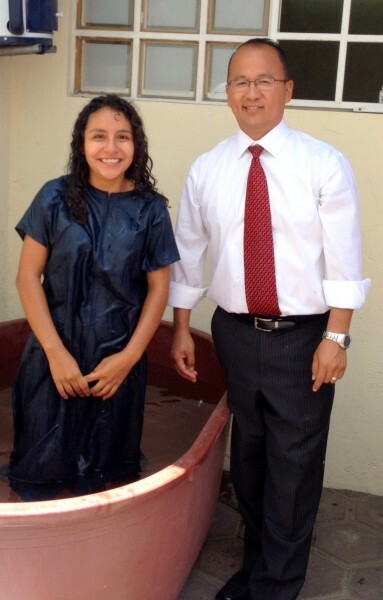 I had the privilege to baptize our own daughter Sarah. Today was also a special Sunday because we celebrated Easter Sunday — we celebrated the resurrection of our Lord Jesus Christ. 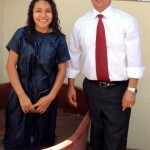 We also baptized 4 other people of our church. What a blessing is to see our church growing in grace and in numbers. 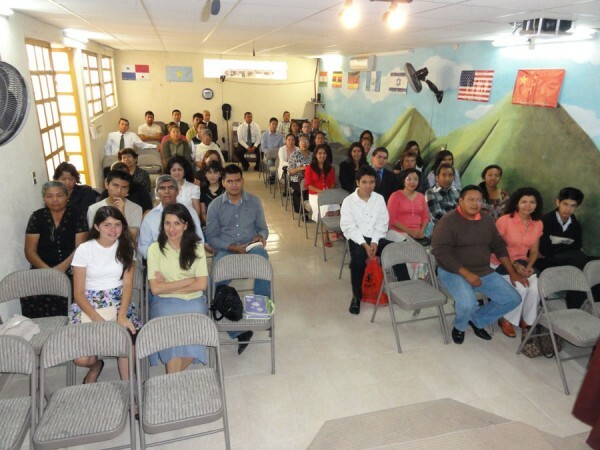 We had 99 adults during our Sunday morning preaching service (not counting the children’s church nor the nursery). 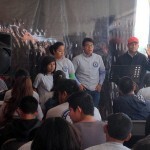 Three of them were first time visitors and we had one person accepting Jesus as his personal Savior. 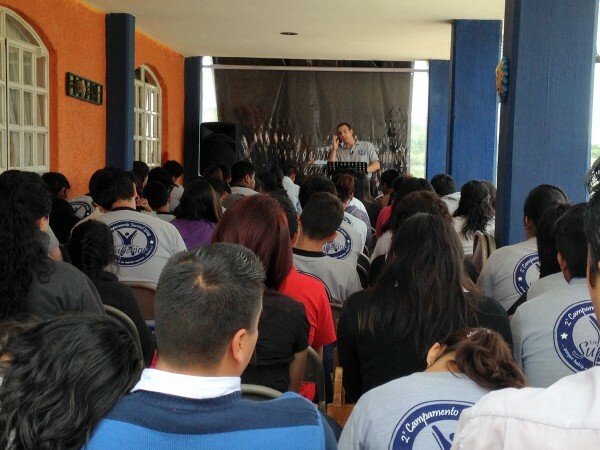 From Monday to Wednesday we took our youth group to a Youth Conference in Cuernavaca to Iglesia Bautista Monte Abarim, whose Pastor is Brother Alejandro Ramirez. 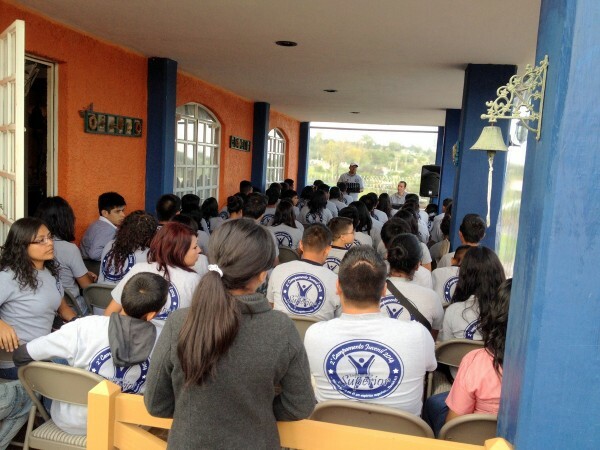 We had 27 young people from our church plus another 20 from Brother’s Tim Aguiar’s church from East Puebla. 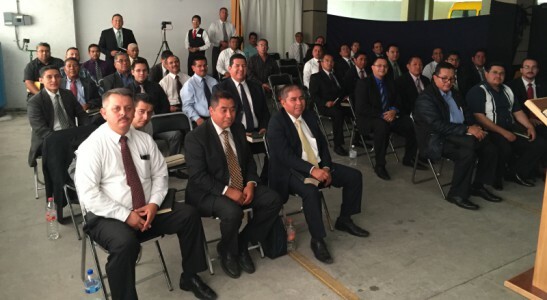 A total of 50 attended the conference just from Puebla — What a blessing! — 10 years ago I only took one young man to a youth camp and now there are more young people saved and willing to serve God! 25 in our 15 passenger van! This last Thursday through Saturday my wife and I had the opportunity to attend the annual couples retreat that Bro. 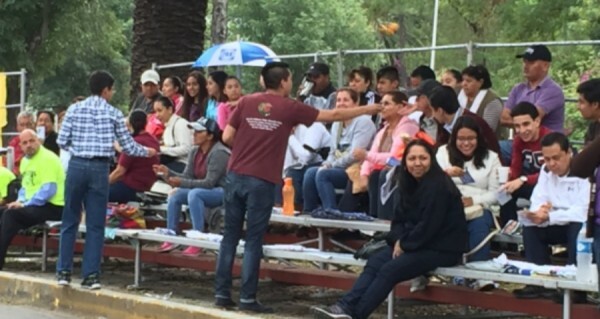 Victor Castillo organizes in Toluca. Bro. S. E. thought during the three days. 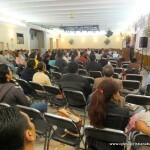 My wife and I came back to Puebla blessed by the preaching of the Word and the fellowship. Today we had Bro. 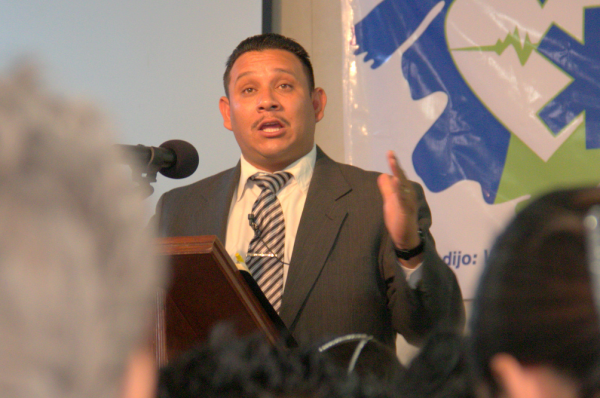 Manuel Garcia, missionary to “maybe Puebla” preach in our church. Bro. 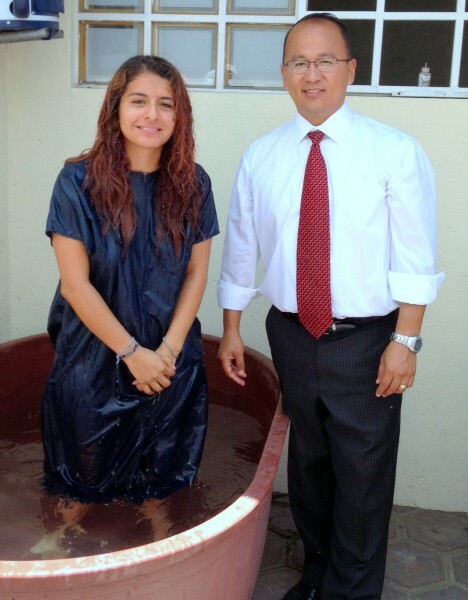 Garcia has been a missionary in Guaymas, Sonora for the last 7 years. 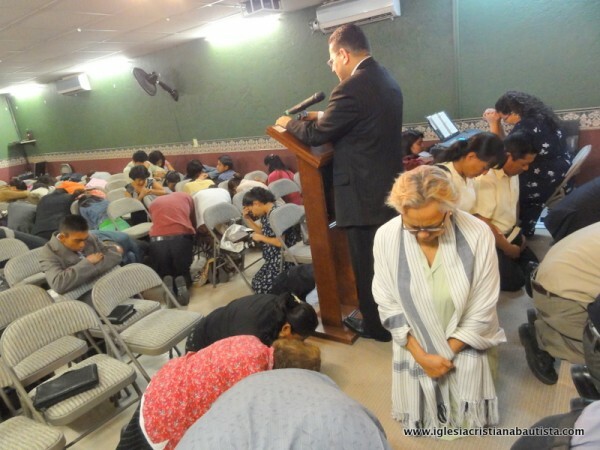 God has put in his heart to visit the south part of the country of Mexico and see where He would lead him to start another church. 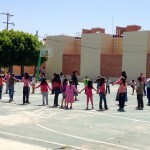 We are praying for Puebla for more missionaries. 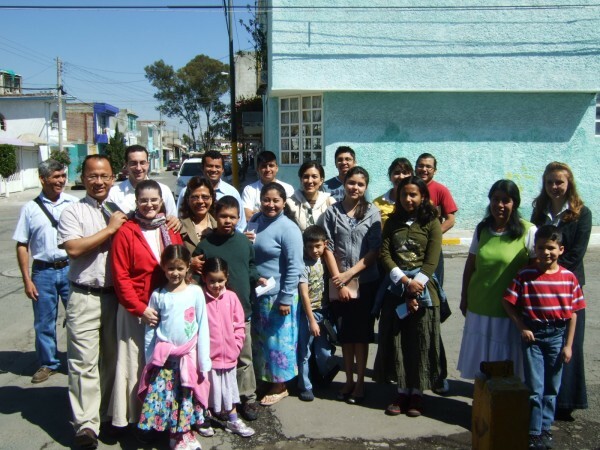 Puebla, I believe, has the least amount of missionaries per capita in the country of Mexico. 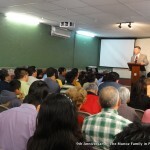 At the moment we have 3 IFB churches in the city. We surely would love for Bro. 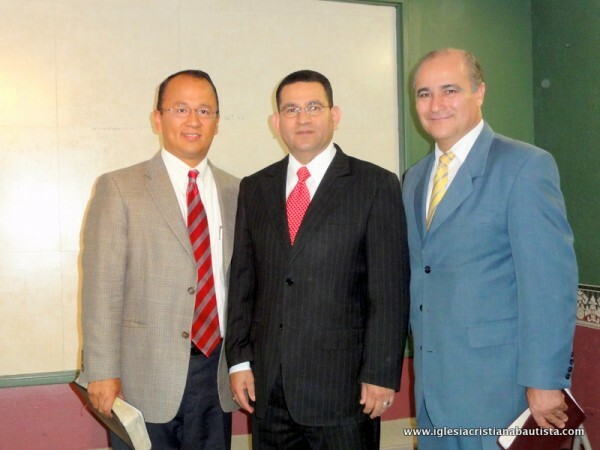 Garcia to come to Puebla, but we will wait to see what God has for him. 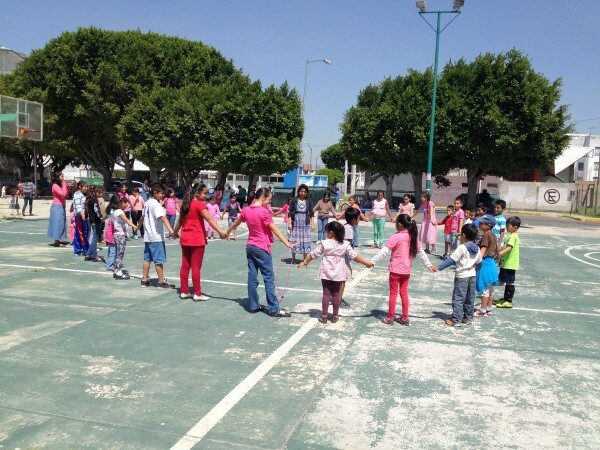 If you don’t know were to go in Mexico as a missionary, please playfully consider the city of Puebla as an option. Please come and help us! Thank you for all of your prayers! God bless you. 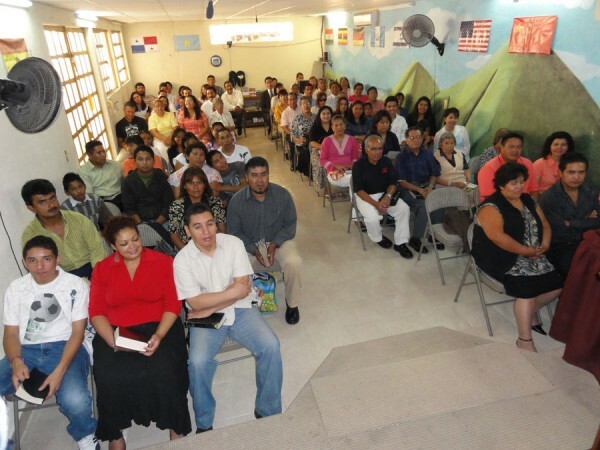 One of the highlights of our church is our Missions Conference. This time we had Missionary Ron Goodman and Nick Sutmaier. They did a very good job, and at the end of the conference, God allowed us to double our Faith Promise for the year from $6,000 dollars to $12,000 dollars. Lord willing we will be able to take on more missionaries. Also, next semester we are having 5 of our young people going off to Bible College. 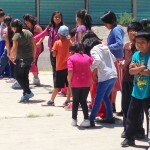 We already support 3 of them with $50 dollars a month, and this will allow us to help the other two. 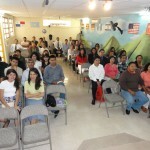 We are now in the second year of our Bible Institute of our church. This semester we have 12 students that are studying hard in the institute. Three of them come from one hour away three times a week from a little town. They are a very poor family but are excited to learn in our institute. 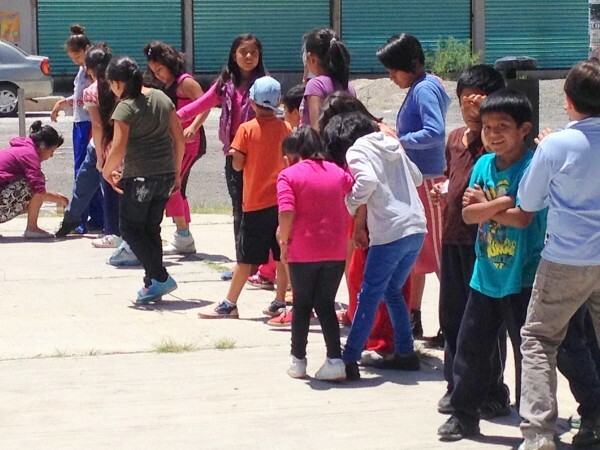 The cost for each student is about $100 dollars a month per semester. 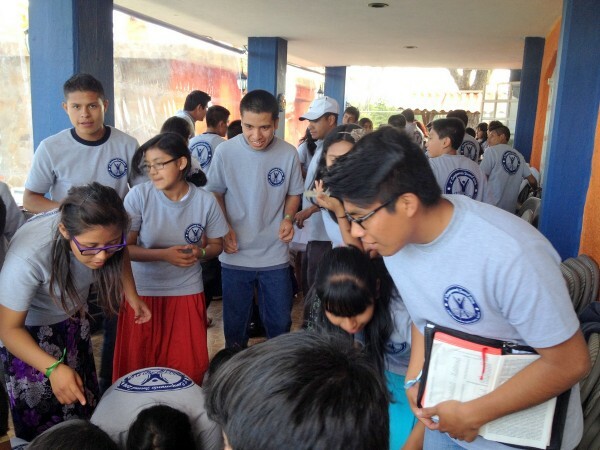 If God puts in your heart to help any of these students, it will be a real blessing for them. Every year, during The Day of the Dead, we give out 20,000 to 30,000 tracks at the main city cemetery. This coming year we would like to invite churches from the States to help us give 50,000 tracks during that same day, but in different cemeteries. It will be an exciting time to see all those souls going to the cemetery to place food in the tombs of their loved ones, and be able to give them a gospel track and try to win them for the Lord. Also, if your church could help us buy the tracks, which cost about $100 dollars per 10,000 tracks we will appreciate it! 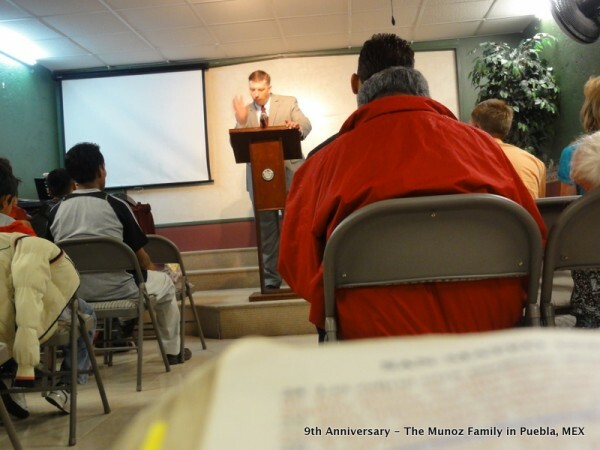 Starting January 17, 2010, we are planning to have two services for our church, since we do not have enough space during our Sunday morning meetings. The first service will be at 8:30 am, then we will have Sunday school, and then our 2nd service will be at 11:00 am. We ask you to pray for this as we need space and money to be able to build and expand our current auditorium. Our small auditorium can seat about 100 people right now. We have about 150 people that come Sunday mornings and we don’t have any room available now. We are running out of space. We would like to build an auditorium that can seat 250 people plus a second floor with 7 classrooms to teach Sunday school. We have saved $5,000 dollars and we need an extra $15,000 to expand the auditorium and build a second floor for our church. Please help us to pray for this. 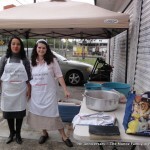 We would like to invite you to subscribe to our blog: www.reachingpuebla.com. 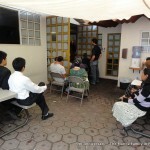 We will be adding our prayer letters, pictures of our ministry and more current updates of the work here in Puebla. You can even drop us a note and maybe let us know that you are praying for us. We certainly appreciate your prayers and support! 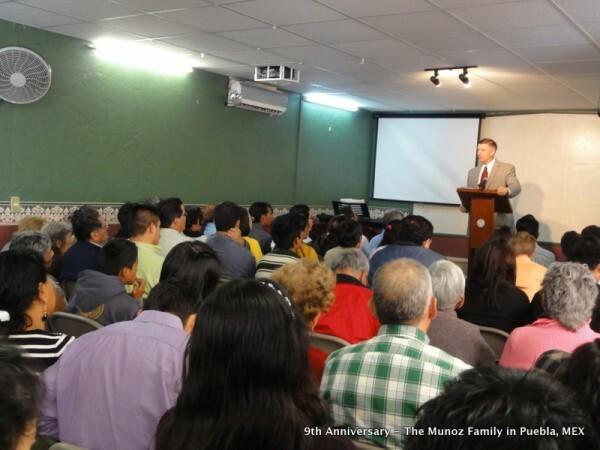 Yesterday we celebrated our 9th Church’s Anniversary here in Puebla, Mexico. Bro. 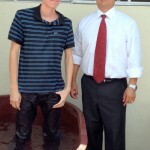 Matt Johnson, missionary in Tula, Hidalgo, preached for us for that special day. He did an excellent job. Bro. Matt and I attended the same Bible Institute (Oklahoma Baptist College). He was a Senior when I arrived in Bible college in 1992. Hard to believe that is almost 20 years ago!!! We had 185 people in attendance. 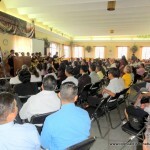 The highest attendance for our anniversary. We try not to promote our anniversaries or conferences in our church since we don’t fit in our small auditorium anymore! 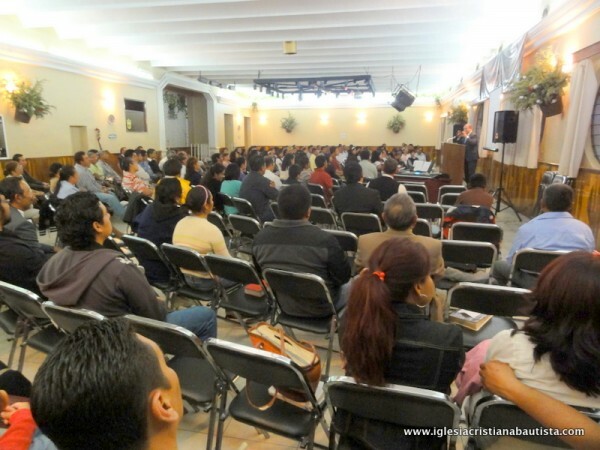 In one of the pictures below, you can see that there are actually 30 people sitting outside the auditorium trying to listen to the preaching. We had at least one young man saved that morning! Praise the Lord. Every year we have our famous and almost “World Wide Known Carne Asada.” Ok. At least known in our World Wide little community. For nine years in a row we have had a special barbecue — Arrachera Steak. We ask people in our church to bring rice, beans (mexican beans), guacamole, salsa (very hot), pico de gallo, tortillas, etc. This time, about six ladies in our church brought their special hot, hot salsas to my table for me to eat. 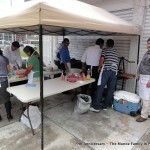 They just want to give their pastor their best salsa, and also their most spicy hot! So, every time I had a steak taco I told the sister that made the salsa: “ok, I am having your salsa right now.” And, wow, their salsas were super hot. I was sweating. I wish my wife took a picture to show you how red my face was. 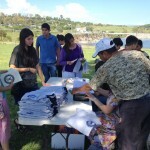 Nicole had some special aprins made with the name of our church and gave them away to those that helped in the event. Thank you for all your prayers and support many of you have shown towards our ministry. 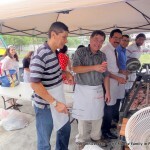 Last week on Monday, we celebrated 4th of July inviting all of the people of our church. Every year seems that more people come! I guess they really enjoy the hamburgers. We had a good time. 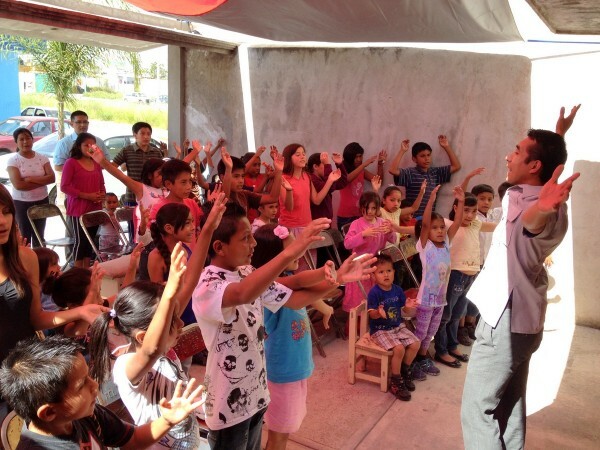 People here in Mexico appreciate what the United States have done, specially when refers to missionaries. 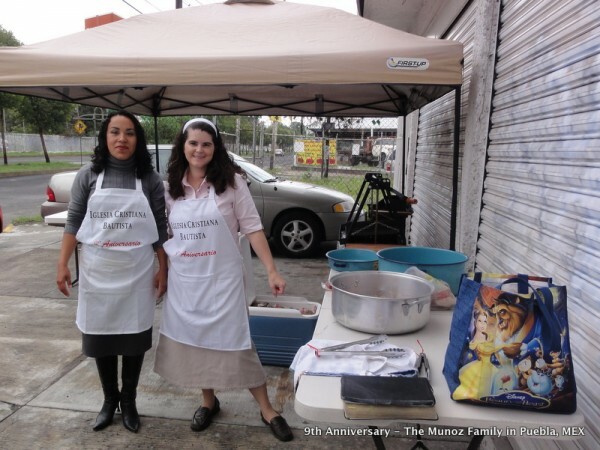 They know that missionaries have sacrificed their lives to bring the Gospel to Mexico and now, there is a fire for Mexico to send too missionaries to other parts of the World. 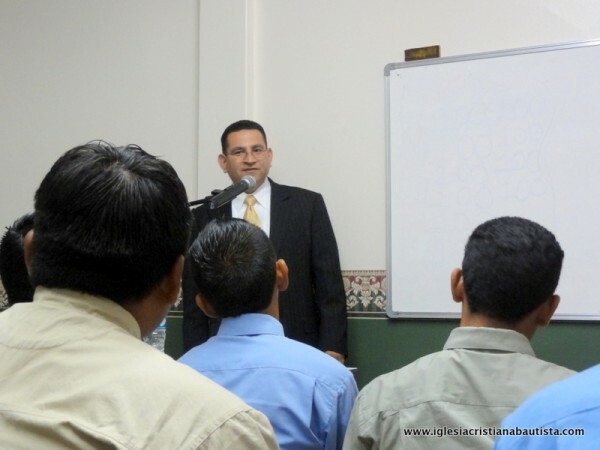 This last Wednesday we also had the blessing to hear Bro. Frank Caseres, from Atlanta, Georgia, preach in our church. He was visiting Bro. 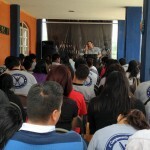 Tim Aguiar here in Puebla for a conference that he had. Bro. Caseres was a tremendous blessing. 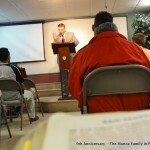 He preached a great message regarding a growing church. 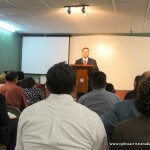 There is a picture of him preaching below in the gallery… check it out! 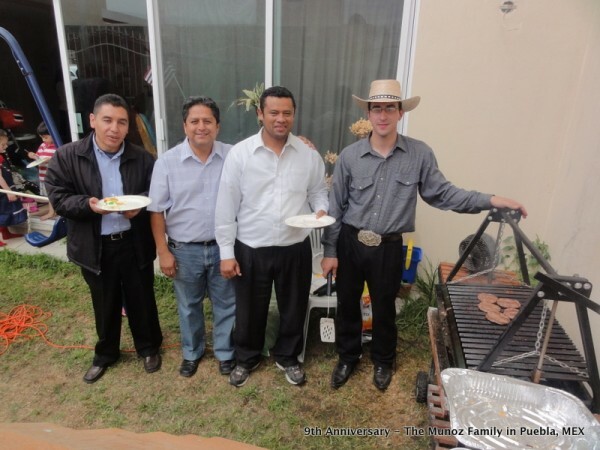 This last Monday we started our Biggest Conference of the Year which is our “Conferencia de los Fundamentos.” This year we invited Pastor Luis Ramos from San Luis Potosí, Pastor Luis Parada from Long Beach, CA, and Pastor Alejandro Córdova from Celaya, Guanajusto. It was a great Bible conference to say the least. 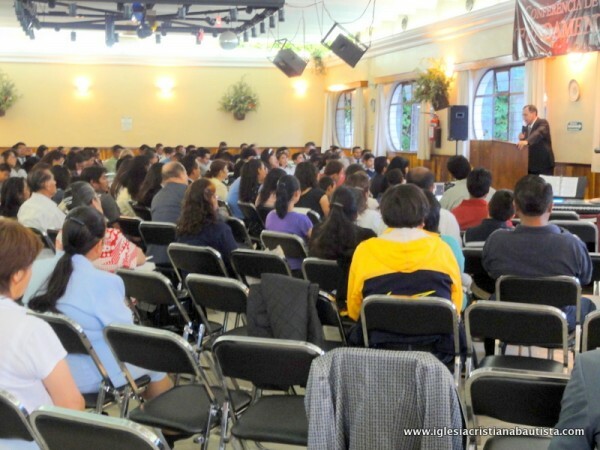 God blessed in a tremendous way and we had many testimonies from people that came from afar and also people from our own church that the conference was a big blessing for their lifes. 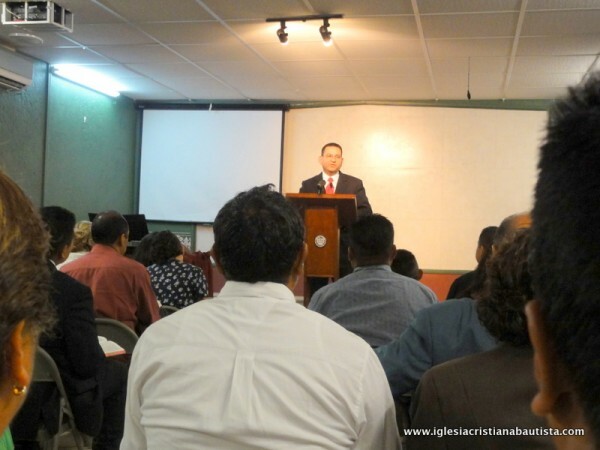 We started our conference Monday afternoon with two preachings and continued with five sessions on Tuesday morning and two more preachings on Tuesday night. We had the same schedule for Wednesday. We spent over $25,000 pesos but it was well worth it. At the beginning of the conference we only had like $500 pesos and God provided exactly what we needed for the whole conference. I don’t know the exact number that we had every night, but it was probably close to 250 people. We were hoping to have over 350, but still God moved in a marvelous way. I would like to thank all of you that knew about our conference and that were praying for us. Now that the conference is over, we are getting ready to start our building plan. We have over $13,000 dollars to do this and we are excited about expanding our auditorium. We know that it is going to be a challenge and we ask you to pray for this as well. If you would like in any way to help with this, please let me know. Every dollar counts! As well as every prayer! We will be updating you with our progress and we hope to finish this as soon as possible. Today we had over 160 people in church and there was no room to seat everybody in our small auditorium. In Mexico, Mother’s day is celebrated on May 10th. Every year we invite all the mothers to come and spend a special day in our church. 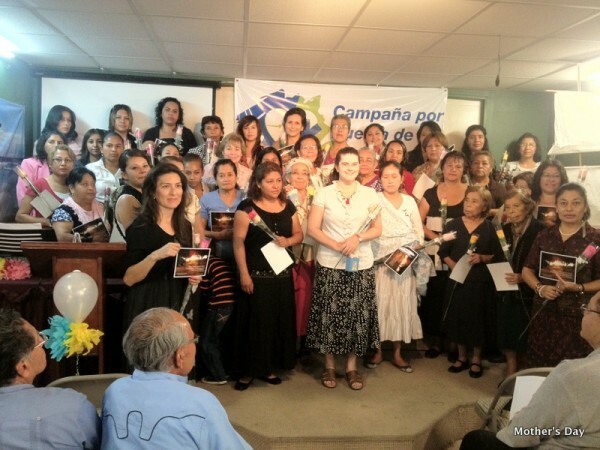 Today we had 46 mothers! 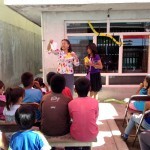 Many of them were brought to church by Mrs. Medel, the lady that I spoke of on our last update. And every year we have two or three special gifts that we randomly give away to them. Two year ago we had a huge big nice microwave! This year we had over $100 dollars worth of gifts. Some small gifts include a nice 6×8 picture with a beautiful background and a Bible verse. We also give them one rose to each one of them. And then the three special gifts: A nice mirror with a light, a set of pans, and a set of pirex glass bowls, which we bought at Costco here in Puebla. Well… One of the special gifts went to Mrs. Medel — the lady I told you about last week — I believe God rewarded her efforts and faithfulness. 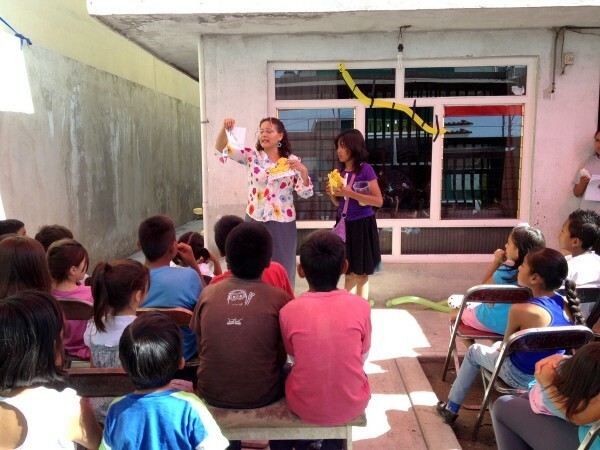 Another special gift went to Mrs. Tere, which help Mrs. Medel with the Bible club that they teach every Saturday. (God also rewarded her sacrifice and love for the kids.) And the last gist went to a lady that has been faithful to our church for over a year now. She told me, Pastor, can I take the mirror home. I just like it! I said, if your ticket gets picked, you can take it! … and guess what happened? She won the mirror that she wanted, and she was very excited and happy! Today we had two first time visitors and one man saved! 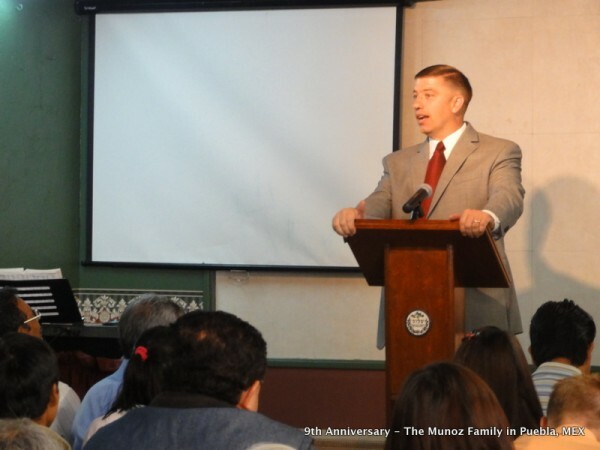 Please pray for me, as this Saturday and Sunday I am going to Mexico City to preach a missions conference with Bro. Clint Rardin. Ok. I will start by saying how proud I am of our daughter Rachel. She has been taking piano lessons since September last year. Yesterday she played the piano during the church offering and she did pretty good. I actually did not know that she was going to play the piano. I guess it was a surprise. Big surprise! She did a good job. I was able to record her and here it is. Last January we had to take a big step of faith. We started our 8.30 am church service (we had to split our church services since there was no room for all of us at the 11 am church service.) Some Sunday mornings at 8.30 am I wondered if we made the right decision. Some times I felt like canceling our 8.30 am church service. But praise the Lord we didn’t. We kept on going and now we are seeing God blessing that big sacrifice. Here is a picture of our 8.30 am Sunday morning service and another picture of our 11 am Sunday morning service. Both services were full and we give the glory to our wonderful God. Please continue to pray for our church so that we can raise $20k dollars to expand our current auditorium. We continue having visitors every Sunday. Before we only had people visiting our church Sunday morning, but now, a lot of times, we have people visiting our church Sunday nights. Yesterday we had 3 visitors in the morning and 5 visitors at night. One of them was a young man I personally led to the Lord 2 weeks ago. He came to church with his girlfriend. His name is Andres Ramirez and her name is Sarah. Please pray for them! Also, yesterday I had the privilege to baptize 6 people. Here are their pictures. And here is another picture of our Saturday soulwinners! They are all in fire for God. 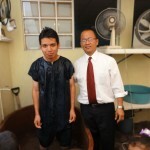 We had 8 people saved Saturday! Actually that number is kind of low for this many soulwinners, but the area that we are visiting right now is very strong catholic. There is a catholic church right in the middle of the apartment buildings (as you can see in the picture below.) This area is known as Loma Bella (Pretty Hill) which really is not very pretty when no one want to hear the Gospel. Praise the Lord eight people got saved! She is doing fine. No contractions. A little tired of being on bed rest for two weeks now. This coming Friday we have a doctors appointment. Please pray that baby Caitlin (I think I spelled it right this time) will wait two more weeks. We are very excited to say the least for another baby girl coming to our family. 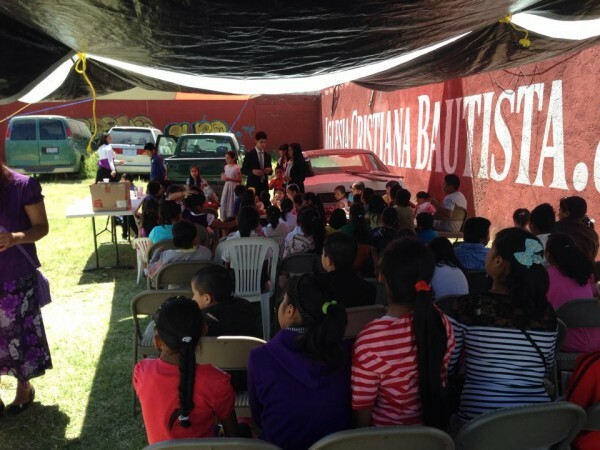 Soulwinning Group From Our Church in Puebla, MEX. 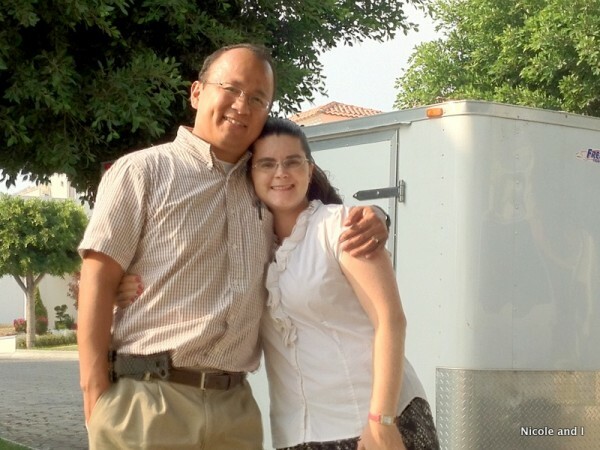 Last Saturday, during soulwinning, my wife and I had the opportunity to go out together. Going with my wife is one of my highlights of the week. I miss her when she has to stay at the house due to her pregnancy problems. 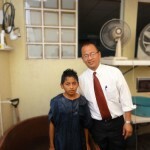 But praise the Lord she is doing much better and Saturday we were able to win two people to the Lord. 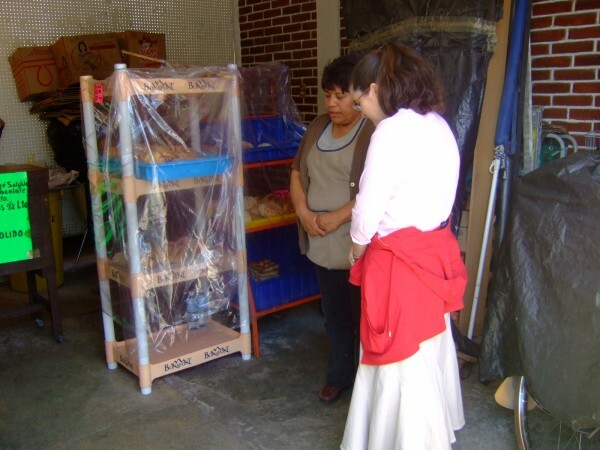 She was able to speak to a lady named María. 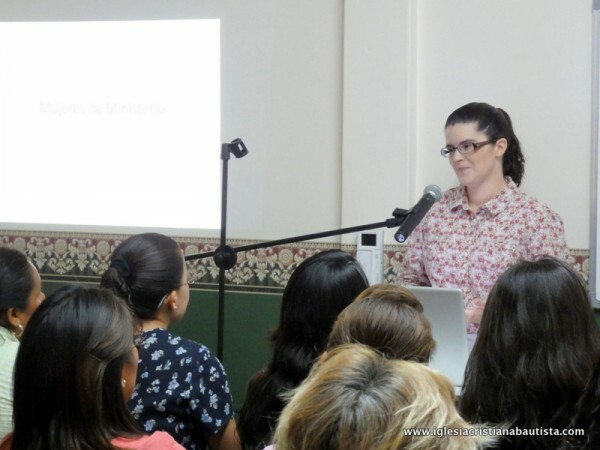 (A lot of Mexican ladies are named María, and also a lot of man…. like José María y Pavón – The guy who led the Mexican Independence about 200 years ago.) Anyway, she told us that she gets up at 4 AM to help her husband make bread and goes to bed at midnight. She gladly heard my wife explain how she could have eternal life and she prayed God to saved her. Nicole is a great soulwinner I think, mainly because she lets God use her life and her testimony. She also speaks very good spanish. I would say 99% with no American accent… or maybe a tiny little accent. Many don’t believe her first language is English. 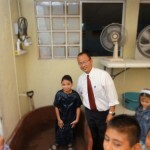 I was able also to lead someone to the Lord. She was a young girl named Sandra. Many times, since there are a lot of JWs in the area, I tell them that we are not Jehova Witnesses nor Mormons. Few times I have said that to a Jehova Witness! Last week we found two houses, one after another, where they were JWs. It is sad to see them lossing souls to hell and knowking on doors all over Puebla. A Kingdom Hall was just build two blocks from our church not too long ago. I will try to post a picture or two of the building. It is so, soo sad. 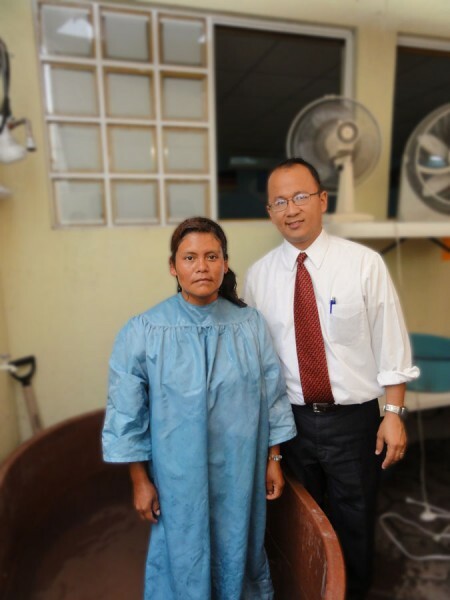 But, praise the Lord, we were able to speak to Sandra, and she gladly accepted Jesus as her Savior! During the last 10 Wednesday nights we have had a class called: First Steps, in which new believers take a Discipleship lessons. 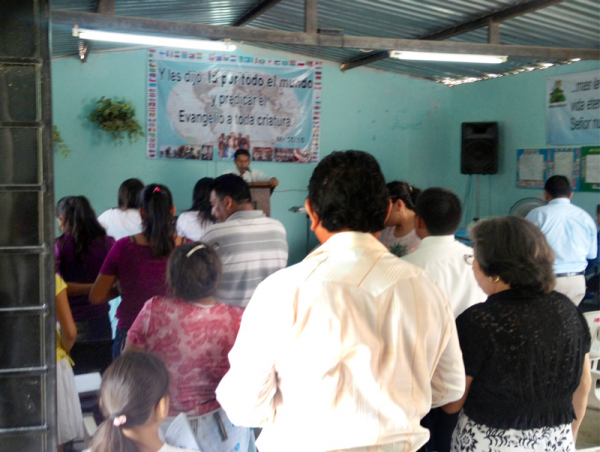 We only allow them to miss one class and Praise the Lord, all of them were faithful during all 10 weeks! We will post some pictures later.